This is a gorgeous soup that has creaminess and richness without any added dairy. It’s a beautiful soup that just happens to be gluten free. Roast Squash and Roast Tomato soup is certainly a family favourite at the moment, especially as the hour has just gone back and we’re back into long dark evenings. This warms you from the inside out. 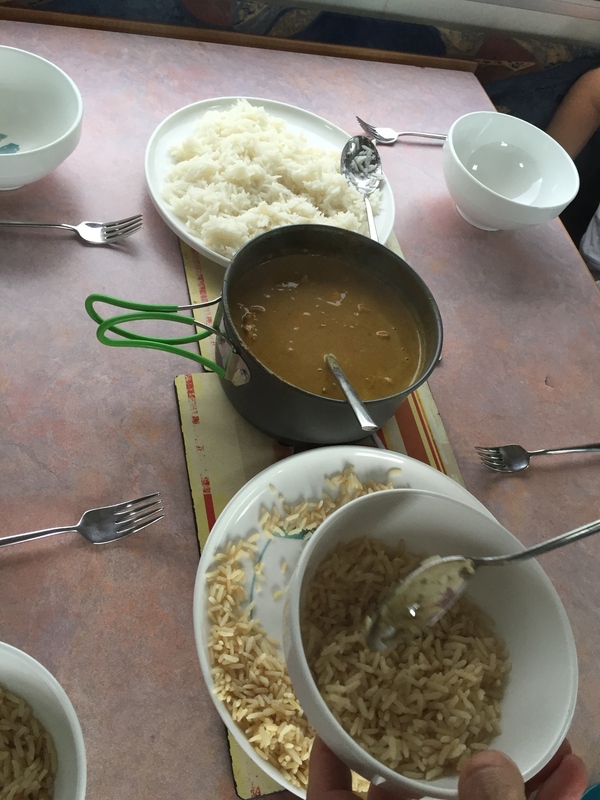 My sons love this soup when they’ve come in from their evening sports training. Ingredients are simple. Another reason I love home made soup is that you cut out a lot of the additives and preservatives that are found in shop bought soups. Turn the oven on to 180 degrees Centigrade. Place the Squash onto a roasting tray and season. Lightly drizzle with olive oil. Put the unpeeled cloves of garlic onto one of the trays. Cut the Tomatoes in half, season and sprinkle some of the dried herbs on top. Drizzle with olive oil. Roast the tomatoes and the squash for approximately 45 minutes. They should both be starting to caramelise slightly, but not burnt. While the squash and tomato are roasting, chop your celery or onion (or both) and sauté in the pot until softened slightly. When the squash, tomato and garlic are roasted, gently remove the roast garlic from its skin and throw all the ingredients into the pot. (Told you this was an easy one). Stir together and add the other teaspoon of mixed herbs. Add at least 750 ml of stock. More stock can be added towards the end of cooking or after it’s been blitzed. I personally prefer my soup thicker as opposed to watery. Simmer these ingredients together for about 15 minutes. At this point the squash is starting to break up a little on its own. When the soup is at this stage it’s ready for blending. I always just use a hand blender instead of transferring to a liquidiser but do whichever method suits you, obviously. When the soup is blitzed, it’s ready to serve. Taste for seasoning and serve. I served my soup with Hannah’s Secret Kitchen Bread, which is gluten free, dairy free and yeast free. I generally buy my vegetables in Aldi or Lidl making this a very economical soup. This will keep in the fridge for three or four days easily. 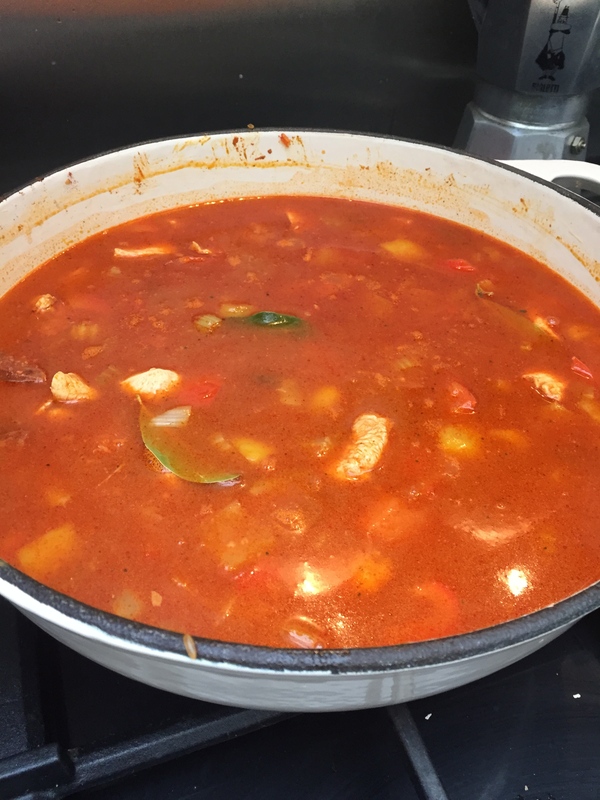 Enjoy this hearty soup and as always, feel free to drop a comment and let me know how you get on. 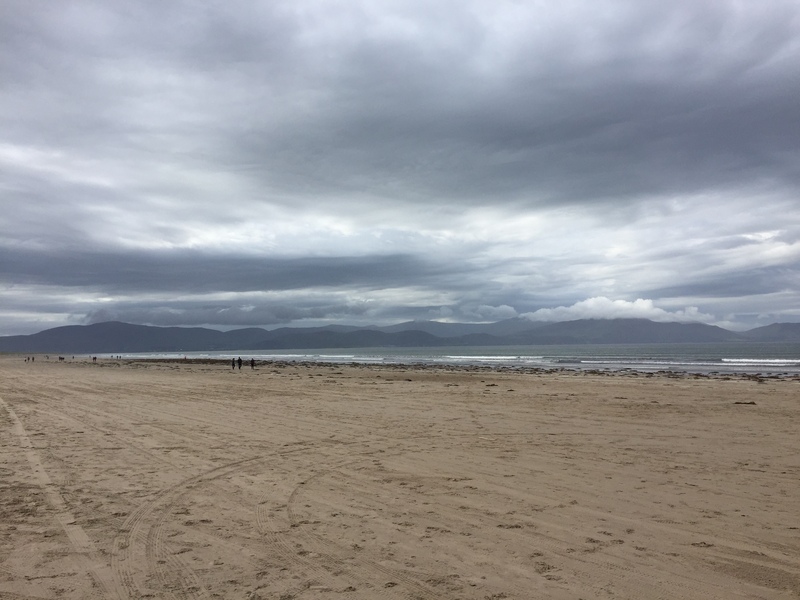 Our family are keen on outdoor life so camping in County Kerry was the holiday of choice this year. 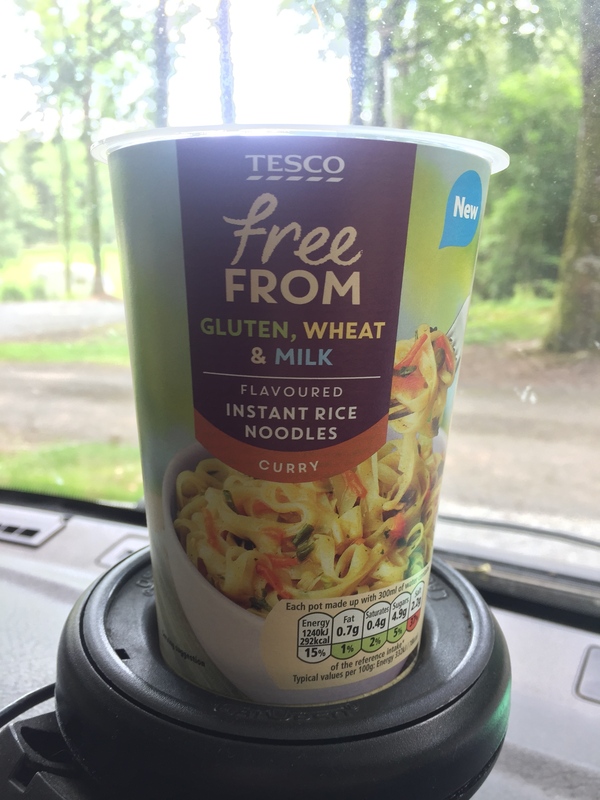 It occurred to me that perhaps because of food allergies or being coeliac, this might seem a daunting task to those travelling around Ireland. Being gluten free in Ireland is becoming increasingly more manageable with the amount of food choices out there. 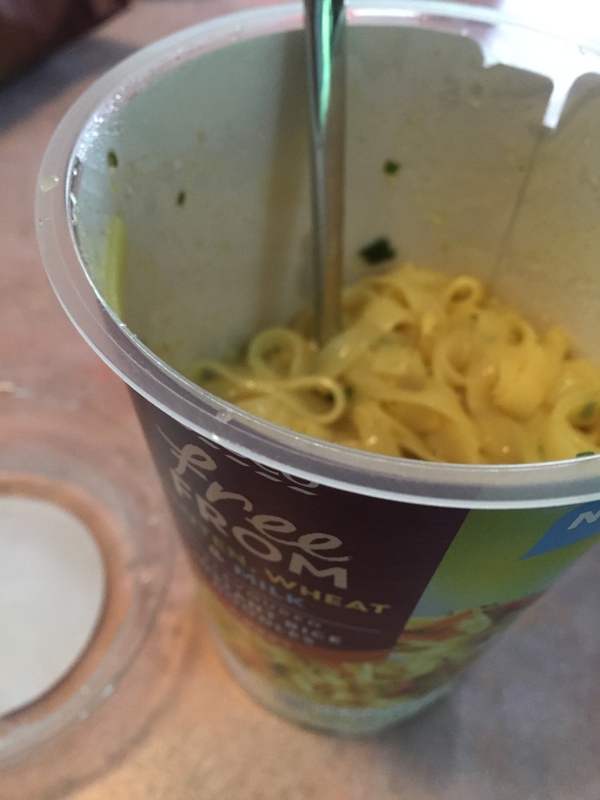 Convenience food that can be easily prepared in a small kitchen area and there are plenty of snack foods available in supermarkets. Campervan – Borrow/Hire Car – Tents and Equipment. Tips – In peak season over the summer months, it is advised to book ahead to as many sites as possible that you think you’ll visit. Before parking up, do a quick recon of the area to discover where the supermarkets are and stock up if necessary. We managed to get our hands on a camper van of the week. Knowing that I had a fridge did make things a little easier for meal planning and bringing food with me. Before we headed off, I made a slow cooked beef chilli casserole that was easily stored in a container. This can be served with BFree Wraps or gluten free Tortilla Chips. I also made a Thai Green Chilli Paste to bring. Again, this is easily stored and the dinner can be easily cooked on two rings of a stove or campers kitchen. When camping I always use boil in the bag rice as it’s so much more convenient for us. I also bought a bucket BBQ for myself that is strictly for my own gluten free food, thus avoiding cross contamination. Gluten Free Burgers with Corn on the Cob. 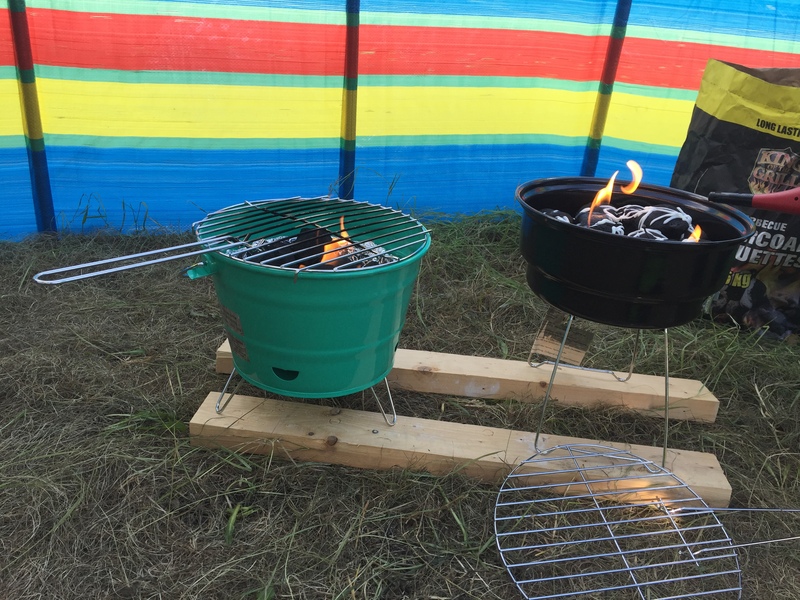 Two BBQs – Keep one for exclusive Gluten Free Food. I also managed a steak dinner in our camper van. Steak, Baby Potatoes and Salad. There are plenty of butchers around Ireland providing excellent quality meat. Another really convenient one pot dinner is hot smoked salmon and gluten free pasta with creme fraiche sauce. Another convenient dinner that can be cooked on two hot rings is a Green Saffron ready to go packet of spices. 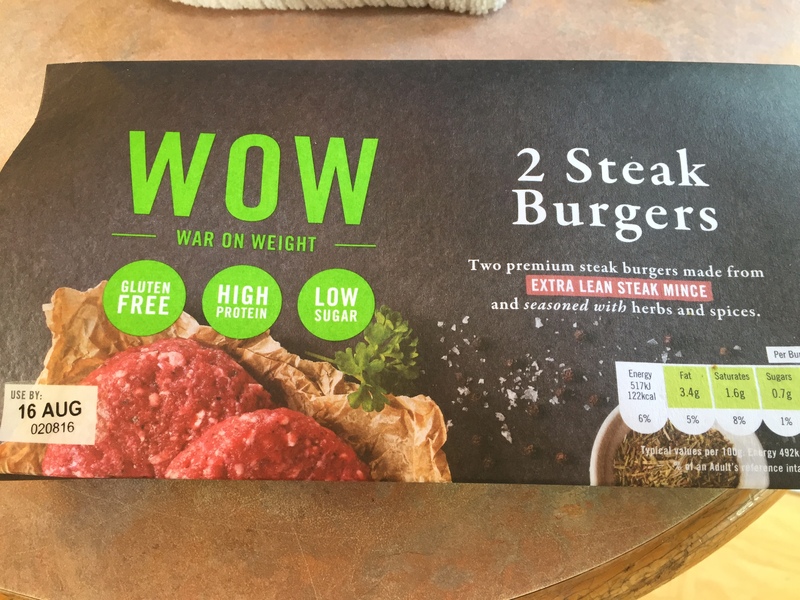 These packets are available in Dunnes Stores and Supervalu. 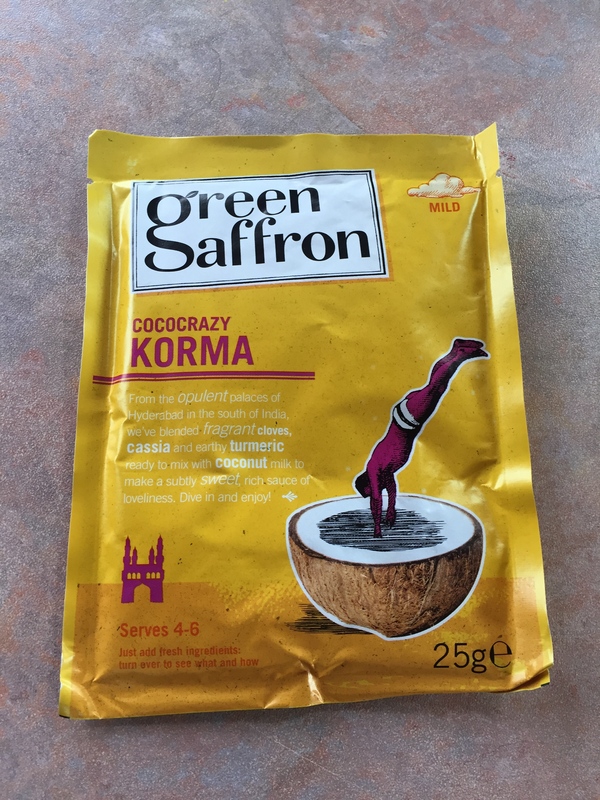 I chose the Korma mix as I thought it would be mild enough for my two children to eat as well. All that I had to add was Coconut Milk, Tomatoes, Yoghurt, Ginger and Garlic. This was delicious. 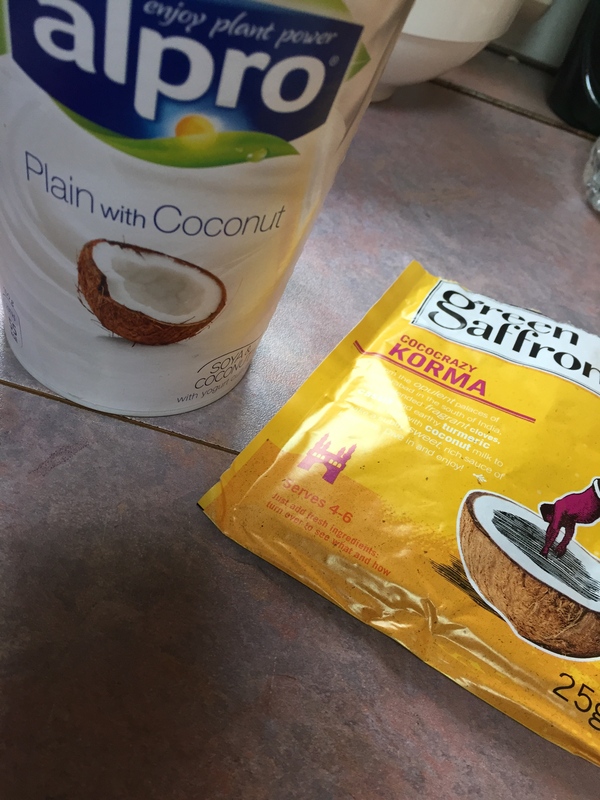 I’m also intolerant to Dairy so I used dairy free Coconut Yoghurt, which worked a treat. 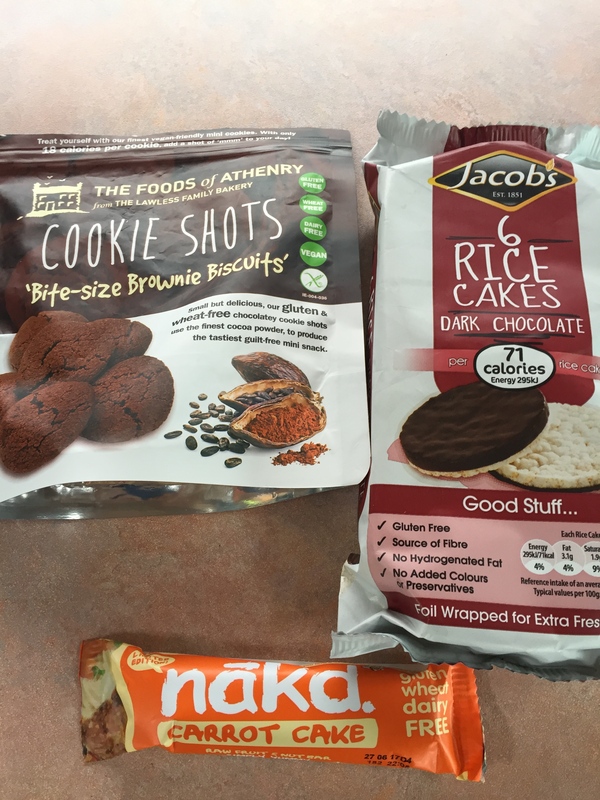 Other snack foods that I brought with me for lunches and grazing were Keogh’s crisps which are my favourite gluten free brand as their Atlantic Sea Salt flavour are also dairy free. There are several brands of gluten free crisps in Ireland including Tayto, O’Donnell and own brands in Aldi or Lidl. 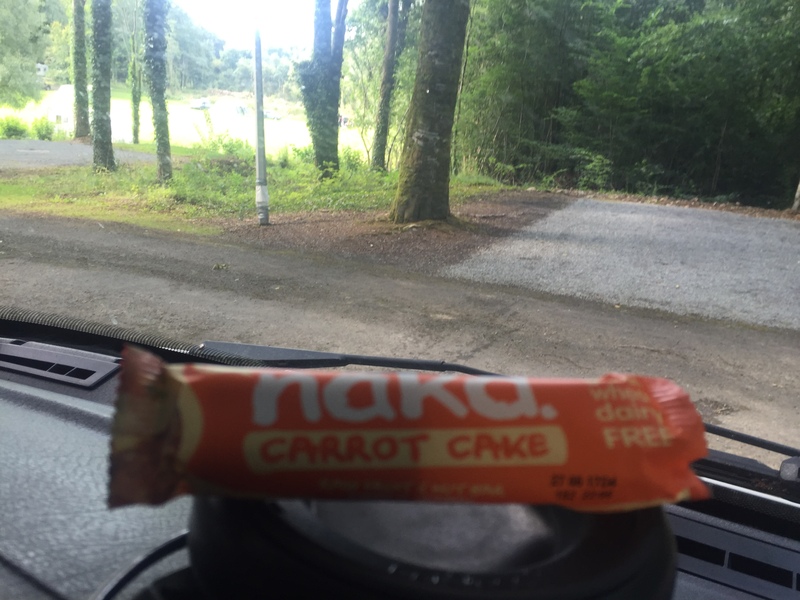 Nakd – gluten free, dairy free snacks. Trek Bars are available in many Boots stores and also Dunnes. 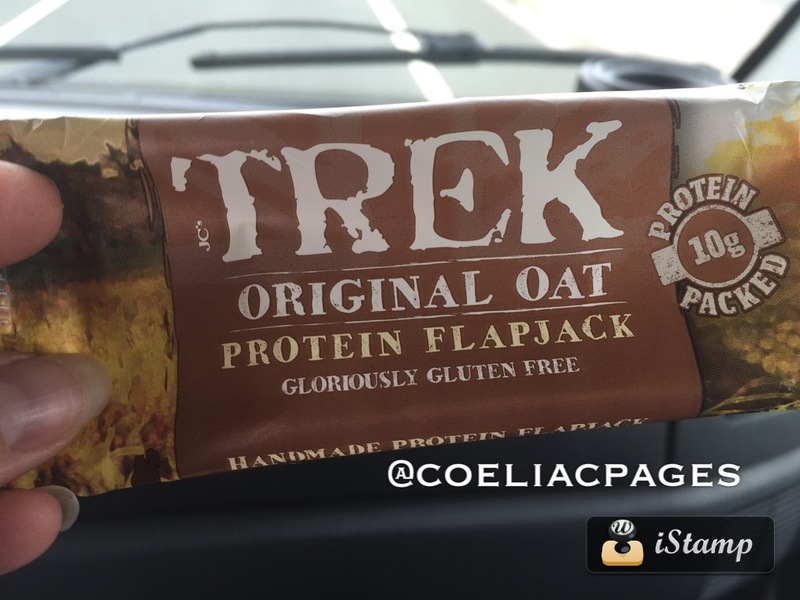 These are often oat based and I find them a great snack to keep you going if you’re out walking during the day. As I’m also dairy intolerant, my staple for breakfast was always gluten free porridge. I find this a great way to start my day and to keep me going for a few hours. There are lots of various gluten free cereals available in Ireland. There are plenty of amazing views in Ireland. 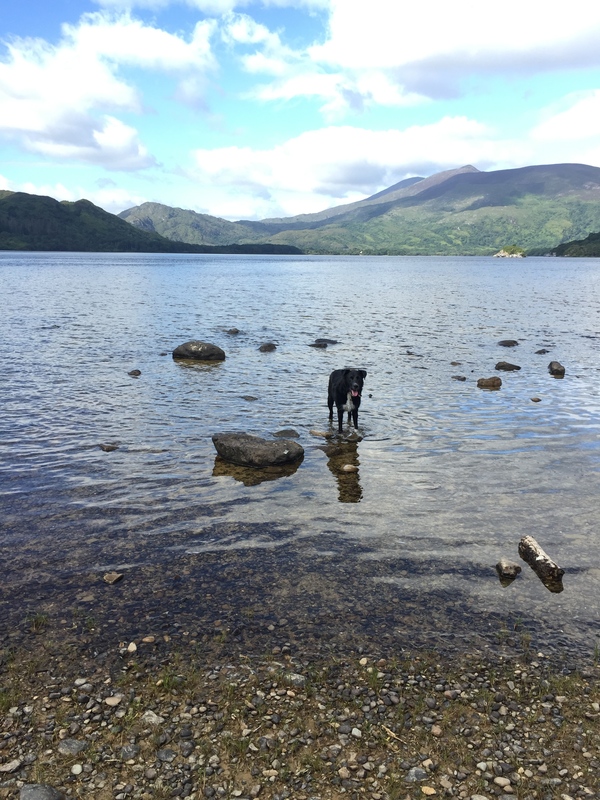 We chose the Wild Atlantic Way around Dingle and Killarney. Campsites can be found via the Camping Ireland Website or App. Views such as this can be found. 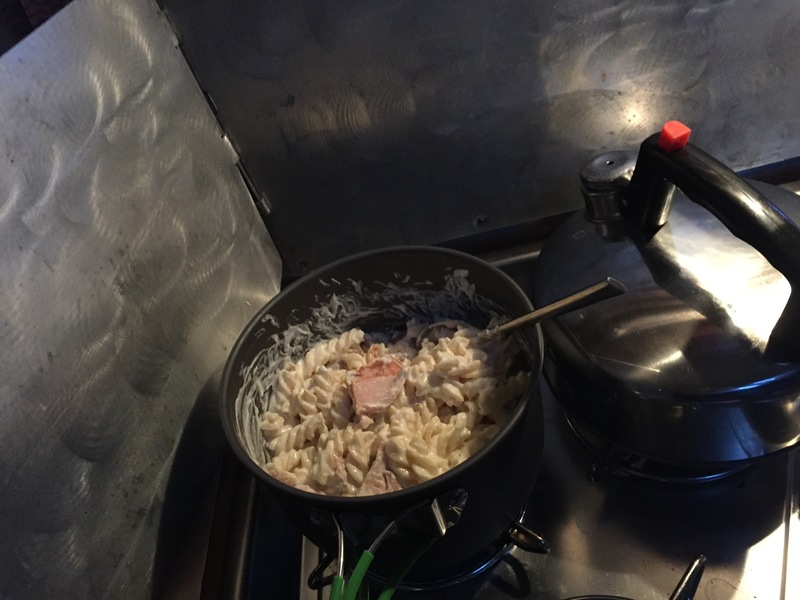 If you’re choosing a campsite for a tent, perhaps make life easier by choosing a campsite that has a campers kitchen. I was lucky enough to cook in a camper van on this occasion but if I was in a tent, use of a kitchen can make a difference. 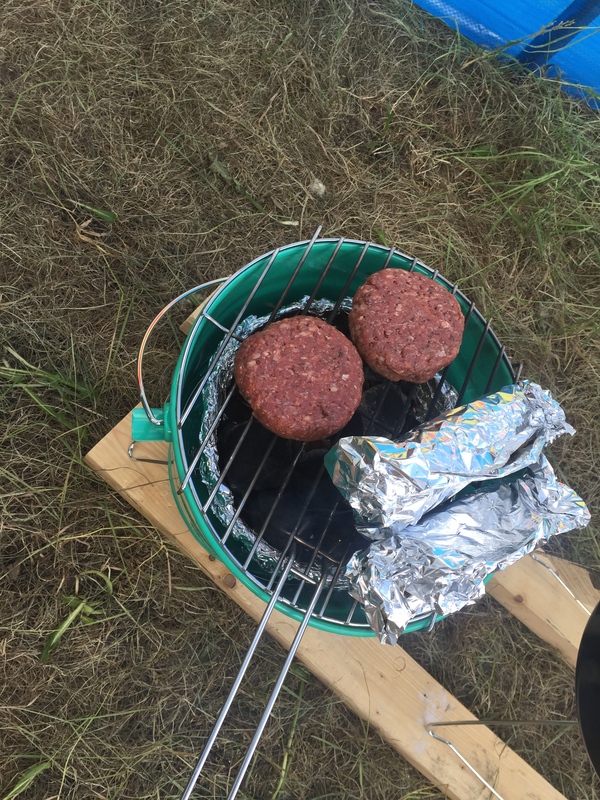 Camping around Ireland doesn’t have to be stressful if you’re coeliac or gluten free. A little bit of preparation and meal planning is all that it takes. Hopefully this post will give you the confidence to go out and try it. If you’ve any questions, just contact us here on info@coeliacpages.ie or comment below. 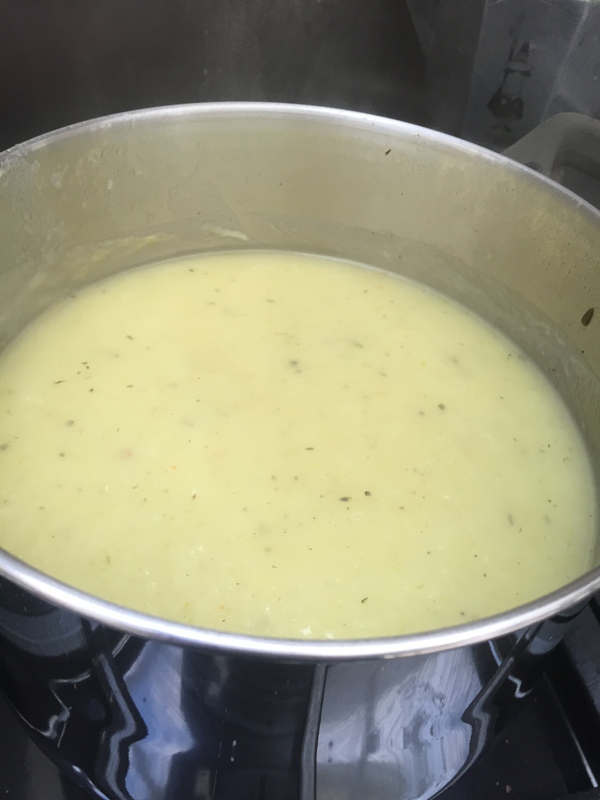 Gluten Free Leek and Potato Soup is such an easy recipe that can be prepped and cooked in under one hour. It will easily keep in the fridge for three days. I’ve made this version, dairy free also, but you can add some milk or cream for an extra creaminess if you wish. Leeks can often have dirt inside them which is a natural occurrence as they are growing. The best way to remove this dirt is to remove the root and split the leek lengthways before washing. 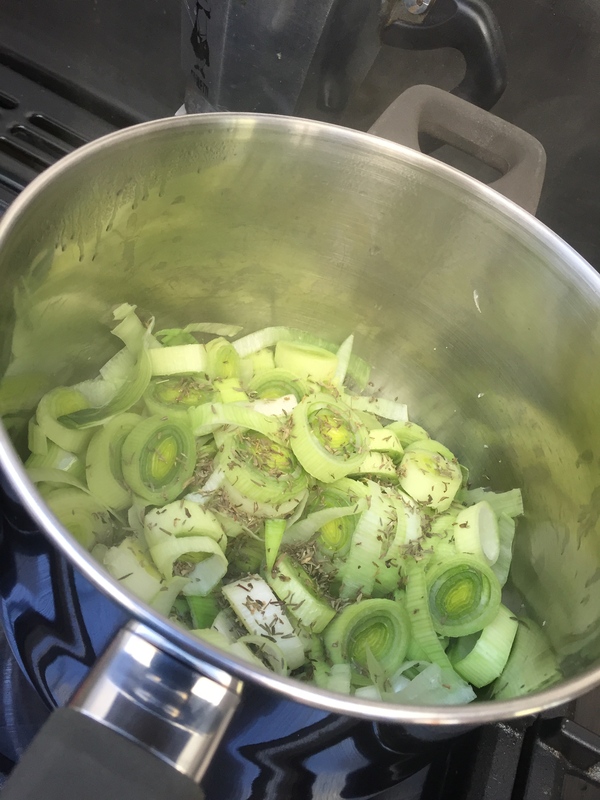 The leeks that I used in this soup were remarkably clean so I rinsed and chopped. I then put these chopped leeks into the pot and sweated them off with a bit of oil. This is done over a medium heat so as not to colour but just soften them down. I also added the dried thyme. 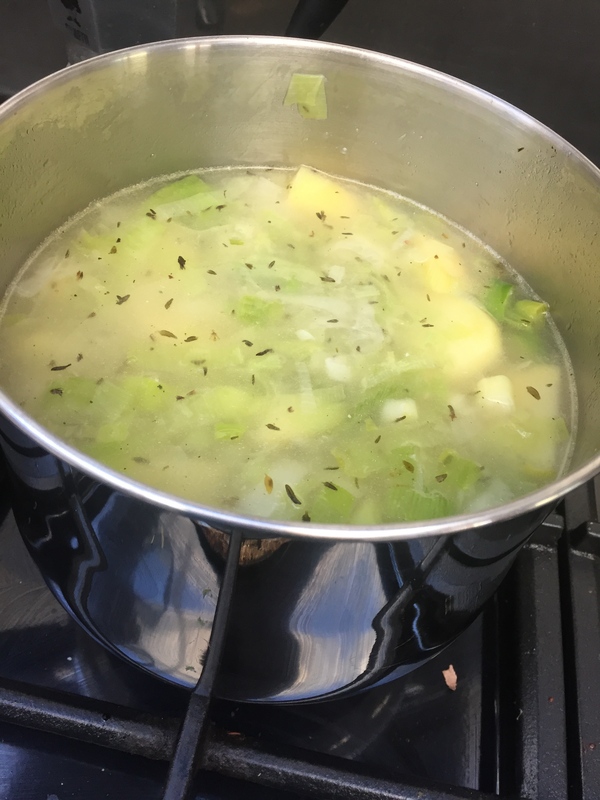 After approximately 7-8 minutes, I added the potatoes and let the two ingredients cook together for a few minutes before adding the stock and the bay leaf. Once you’ve added the stock, cover and cook until the potatoes are soft. Before you blend or blitz the soup, remember to remove the bay leaf. I have a hand blender that I use for all soups as I find it easier than transferring the soup into a blender and back to the saucepan. Even without the addition of milk or cream, this is a beautifully smooth soup. Feel free to comment and let me know how your soup is. 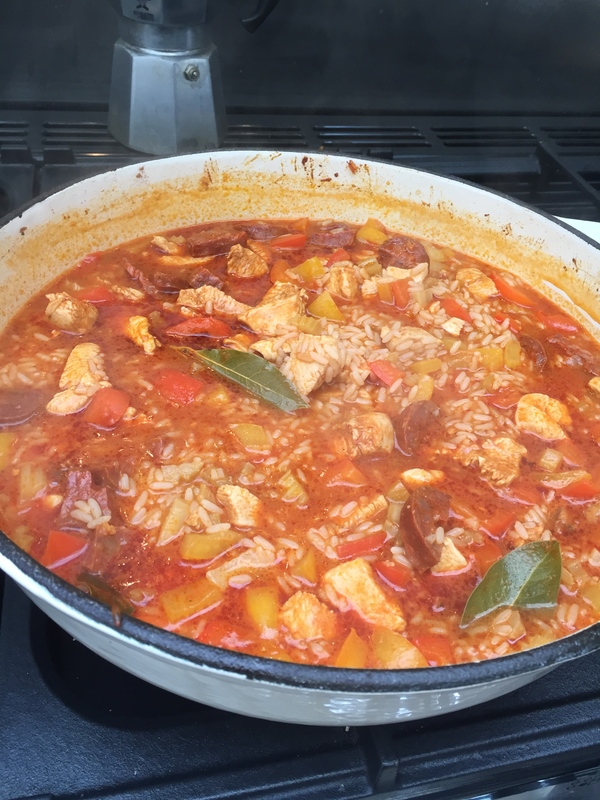 This Gluten Free Jambalaya recipe is the perfect dish to serve both for either a family dinner or upscale it and it will easily feed any number of guests. This is also the recipe with which I won the inaugural Easy Food Magazine, Home Cook Hero Competition for the One Pot Wonder category. 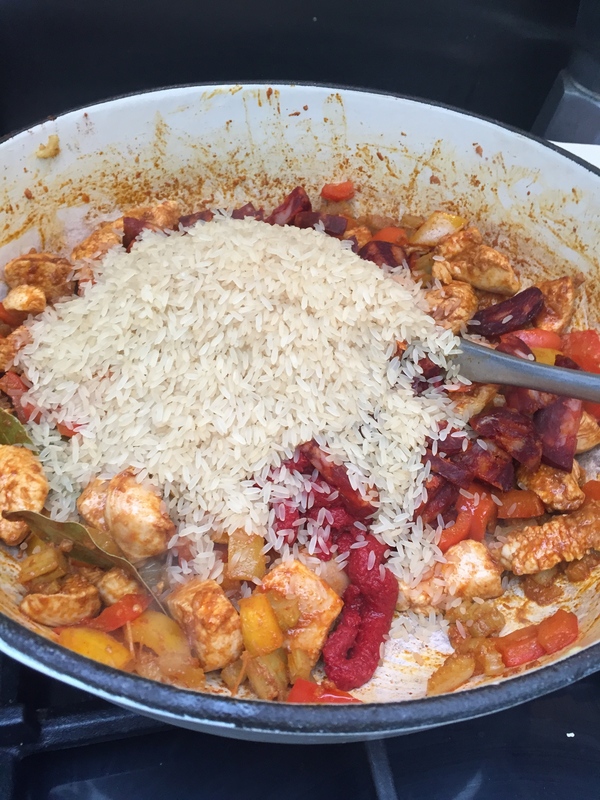 Never use basmati rice – Easy Cook Long Grain works best as it cooks quickly and stops the chicken from drying out. 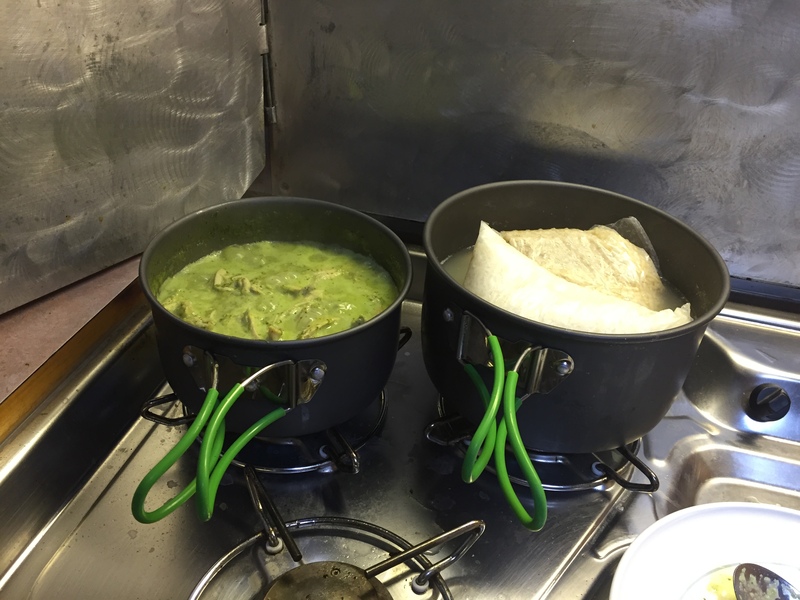 Always use double strength stock as it prevents the dish from becoming insipid. i.e. if instructions say use 1 pot/packet per 500ml, then you’ll need two. You can add prawns a few minutes before the end of cooking time. I always serve this with salad and you could make some gluten free garlic bread. I always cook this in a cast iron casserole that is suitable for hob top, oven and serving dish. I invested in one of these in a Denby sale and it’s been well worth it. You don’t have to spend two fortunes on Le Creuset. 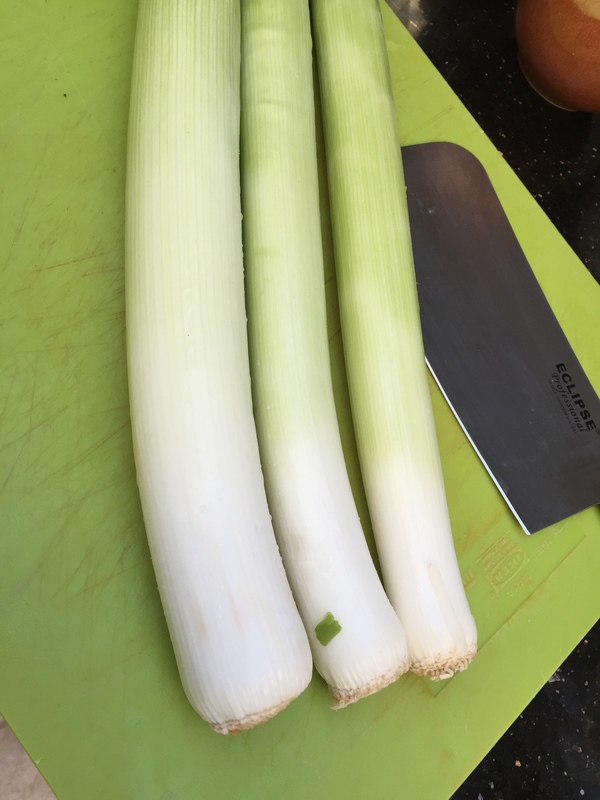 2-3 Sticks of celery – Chopped no bigger than 1cm. 160g Long Grain Easy Cook Rice. 6 Scallions/Spring Onions – Chopped. Preheat your oven to 200 degrees Centigrade or Gas Mark 6. Prepare all of your veg and meat and have everything at hand before you start cooking. I do this for all dishes as it helps the flow of cooking. Heat the olive oil in your casserole dish. Add in the Onion, Garlic, Pepper and Celery. Cook over a high heat to colour this but make sure the garlic doesn’t burn as it will turn the whole dish bitter. 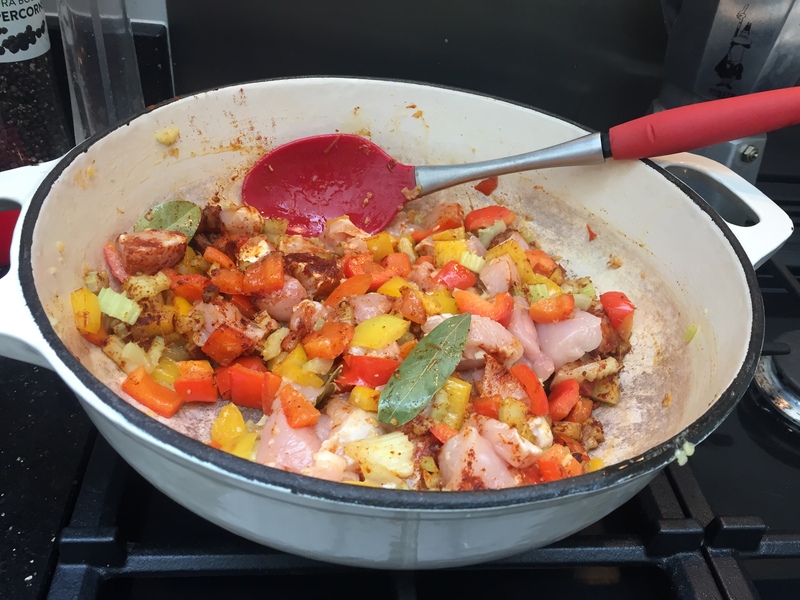 Add the Chicken, Paprika and Bay leaf and cook until the chicken is sealed. Prepare your chicken stock. Add your Chorizo, Puree and Rice. Cook out the puree for a minute. Add your stock and bring to the boil. Cover and cook in the oven until all the stock is absorbed or the rice is cooked. Add the Spring Onions and Prawns. If you’re adding prawns they will cook in the hot casserole back in the oven in under four minutes. Let the dish rest for a minute or two before serving. While the casserole is in the oven, prepare your salad. Let us know how yours turned out! This also a perfect dish to cook extra for reheating. Store in an airtight container in the fridge – I never reheat prawns if you do add them I would advise removing them (eating) before storing for reheat. 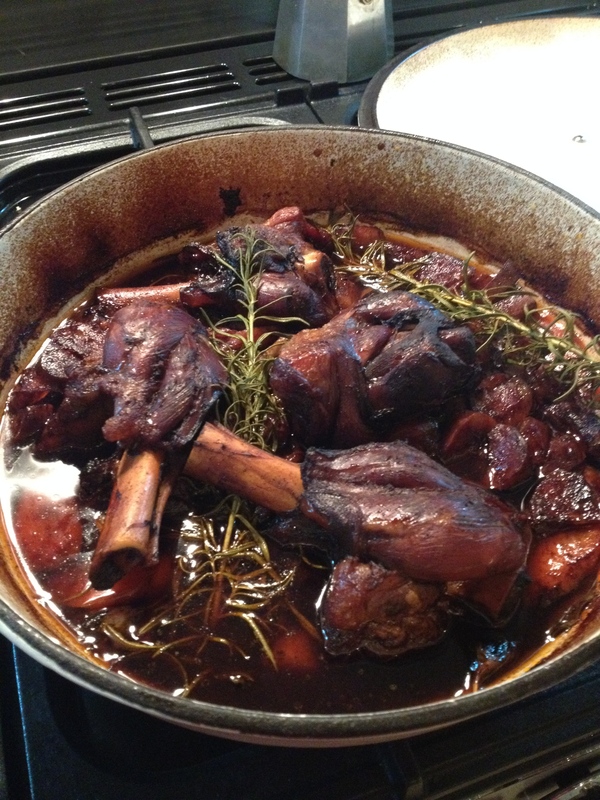 Lamb shanks are traditionally a cheaper cut of lamb. If cooked slowly at a lower temperature, the meat will just fall off the bone. This recipe makes them particularly succulent and tender as the flavours of the chorizo and the sweetness of the carrots is just divine. This recipe is inspired from one of Lorraine Pascale’s books. 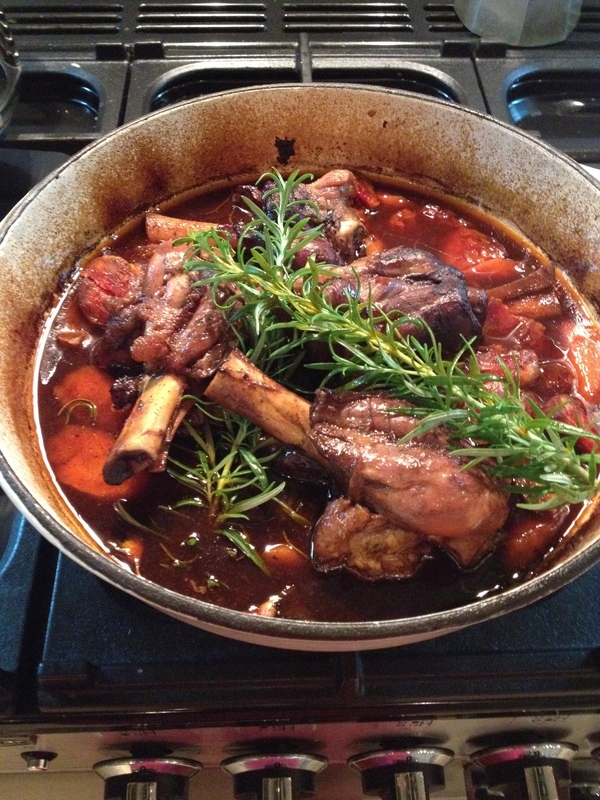 I rarely buy meat in a supermarket and I’ve never seen Lamb Shanks there, so try your local butcher. Don’t be put off by the amount of Balsamic Vinegar in the recipe. Once cooked out the vinegar is actually very sweet and in no way sharp in flavour. 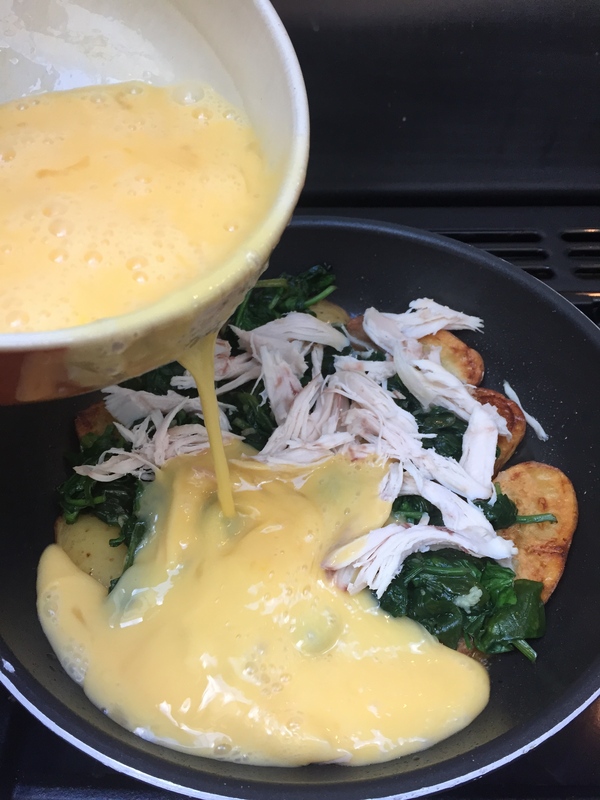 This is a an easy no fuss recipe and a great one to share with friends, I mean what else would you do with the left over Rioja? 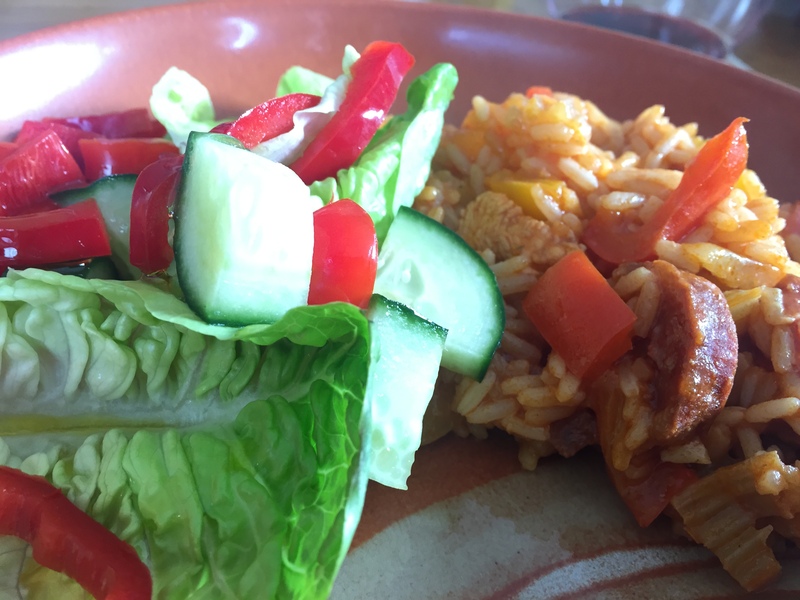 2 teaspoons smoked paprika – check your coeliac society food list. I generally stock up on the traditional spanish tins marked gluten free – often spotted in TK Max or Farmers Markets. 1 Large Red Onion – Peeled and chopped. I love dishes that can be served directly from the cooking pot at the table. For that reason, I invested in a cast iron casserole that is suitable for hob, oven and serving from at the table. 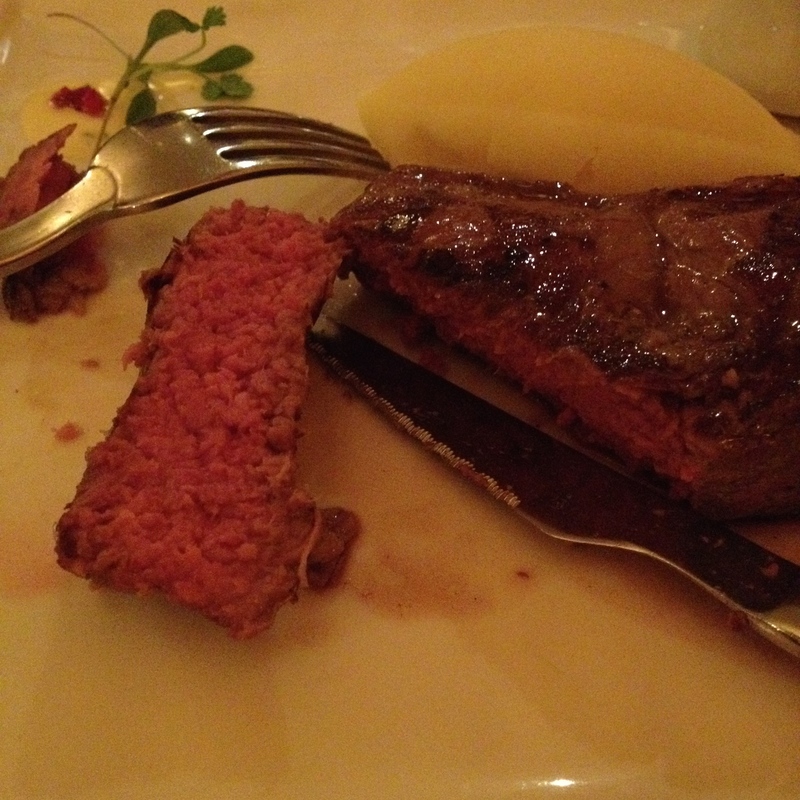 Cooking tip – I cook meat from room temperature as opposed to straight out of the fridge. Preheat your oven to 150 degrees Centrigrade. Season the lamb with salt and pepper. In a heavy based pan, add a little oil and heat over a high heat. 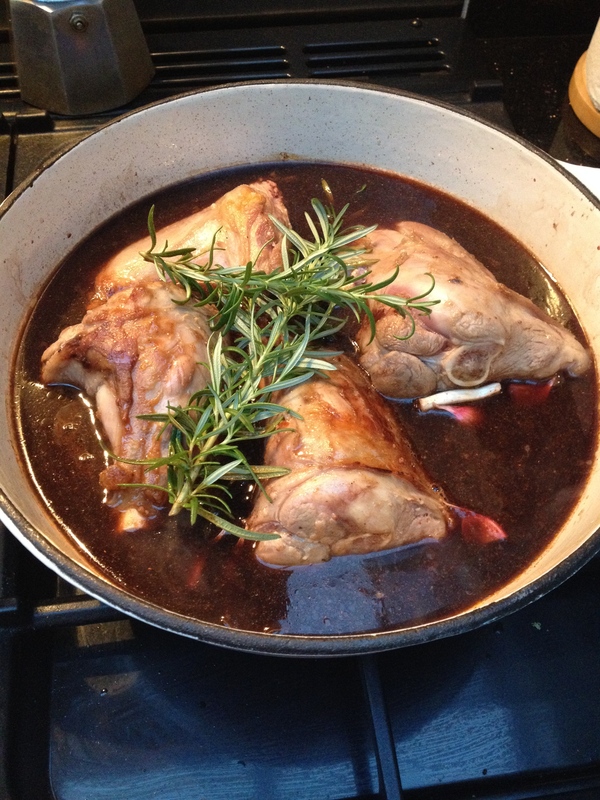 Slightly reduce the heat and add the lamb shanks and brown all over. Remove the shanks. Pour the wine and vinegar into the pan and boil for approximately five minutes. Add the lamb back to the liquid along with the garlic, bay leaves, smoked paprika, peppercorns, half of the rosemary and the beef stock. Bring this to the boil and then place in the oven or two hours. Remove the casserole/pan and add the chorizo, carrots, onion and the rest of the rosemary. Return to the oven and cook for another hour or until the meat is falling away from the bone. Using a slotted spoon, remove the meat and vegetables from the pan. Put the pan with the liquid back on the hob over a high heat and bring to the boil and then keep it at the boil for approximately 10 minutes until the liquid has reduced and become thicker. 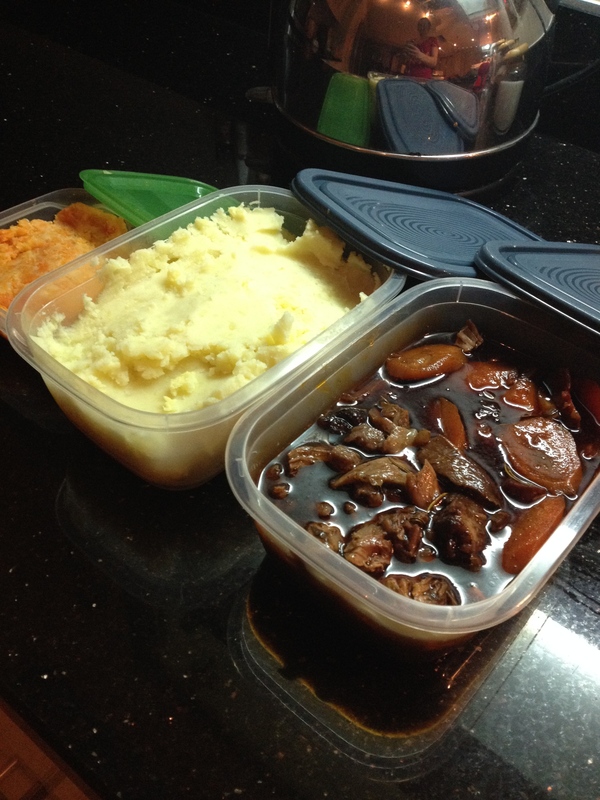 I like to serve lamb, chorizo and veg with buttery mash, carrots and parsnips. I’m a huge fan of smoked paprika and I’ll use Chorizo at any opportunity. 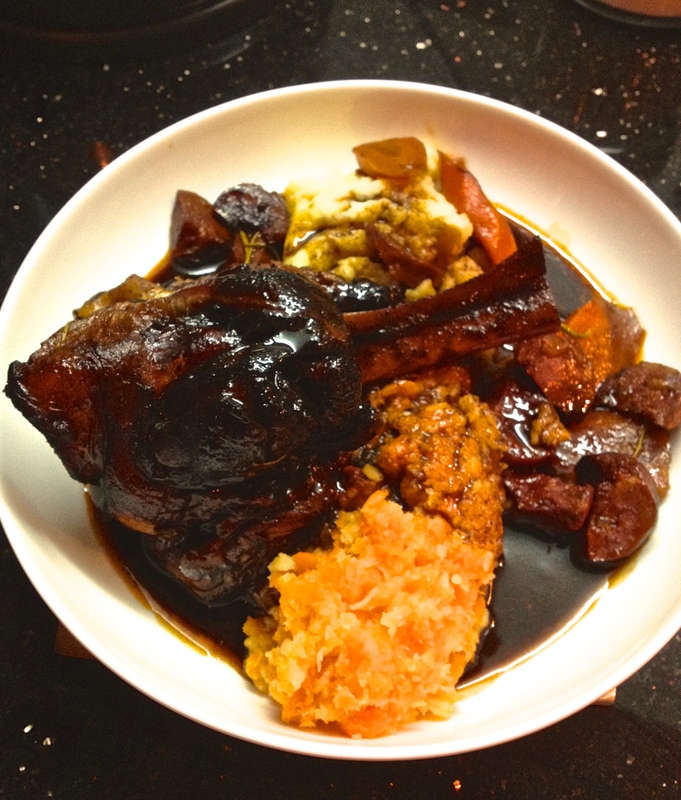 This is also the perfect dish to cook for 2, but still cook the four shanks. What I do, is then take the lamb off the bone and add it to the sauce. This is then ready to get re-heated a couple of days later. A roast dinner without all the effort. I hope that you enjoy this dish as much as I do. Feel free to leave a comment and let me know how you get on. 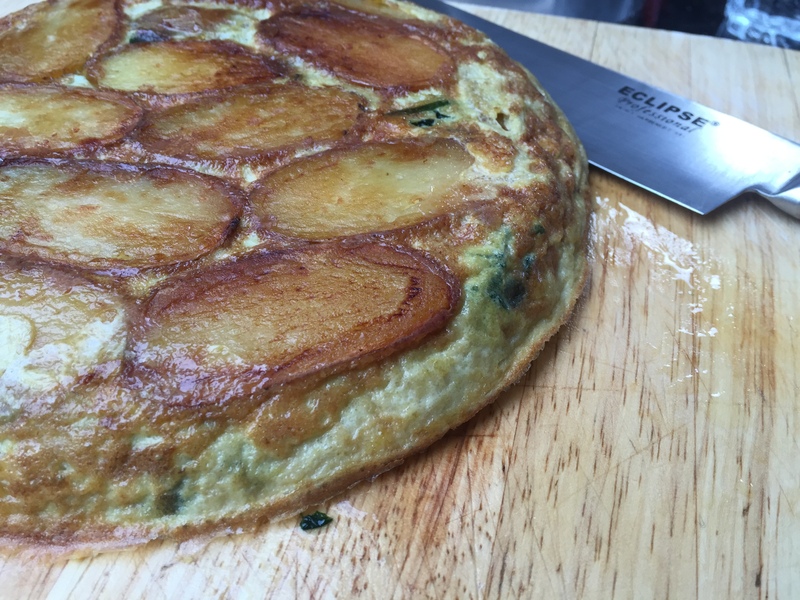 Brunch Frittata – Well actually it would make a great dish for anytime of the day. 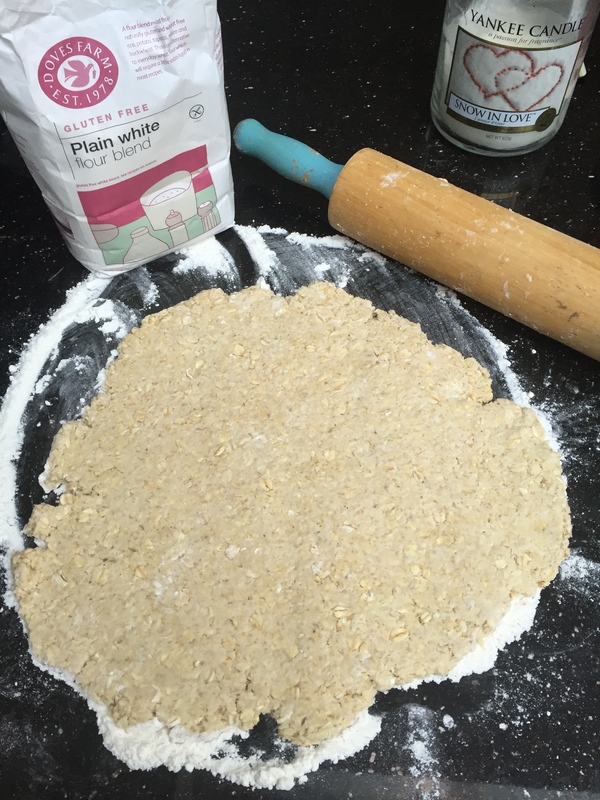 This is a convenient recipe as it contains only naturally gluten free ingredients. 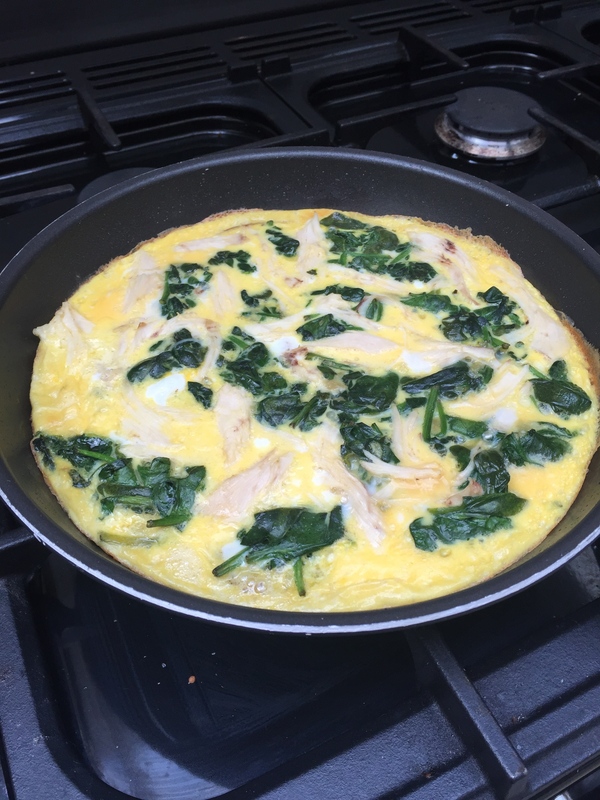 It’s a great way to start your weekend if you have a bit more time to cook and eggs keep you going without the snacking between meals. 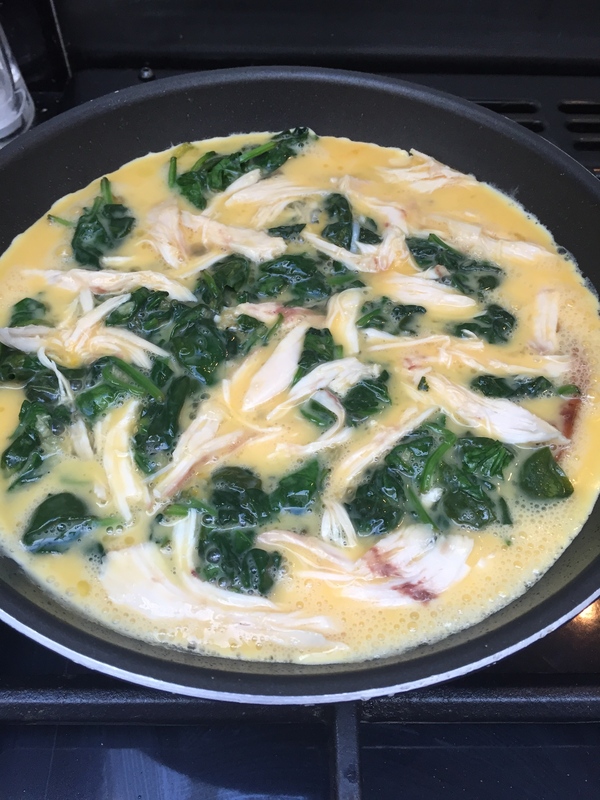 This frittata has a good mix of protein with the wilted spinach and left over roast chicken. It might take a bit longer to cook than a bowl of porridge, but not so long that it’s a chore! I used a heavy based non-stick pan. 4 Large Free Range Eggs – I only ever use Free Range, obviously you can substitute if you wish. 4-5 Baby Potatoes – Enough to cover your pan of choice when sliced. 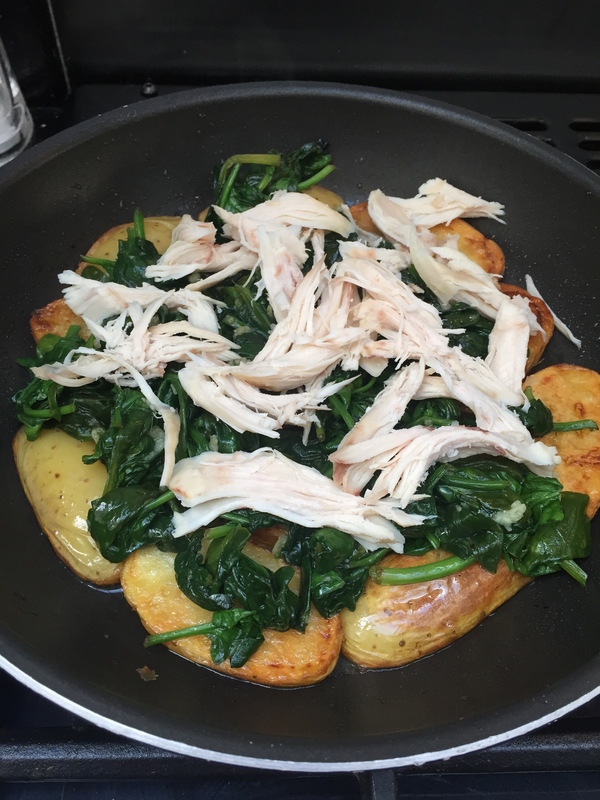 Left over Roast Chicken – Roast chicken breasts on the bone are normally loitering in my fridge. I used over half a bag of spinach from Lidl or Aldi. Tablespoon of Olive Oil for cooking. Add some oil to the bottom of your pan and arrange your sliced baby potatoes to fill the pan. Put these on over a medium heat until they are golden on both sides and cooked through. While the potatoes are cooking, just keep an eye that they don’t get burnt. Wash the spinach and add this to a separate pan with a tablespoon of butter or oil and a crushed clove garlic (optional). The Spinach will wilt down within a few minutes. A also add some Maldon Sea Salt to this, again, this is optional. 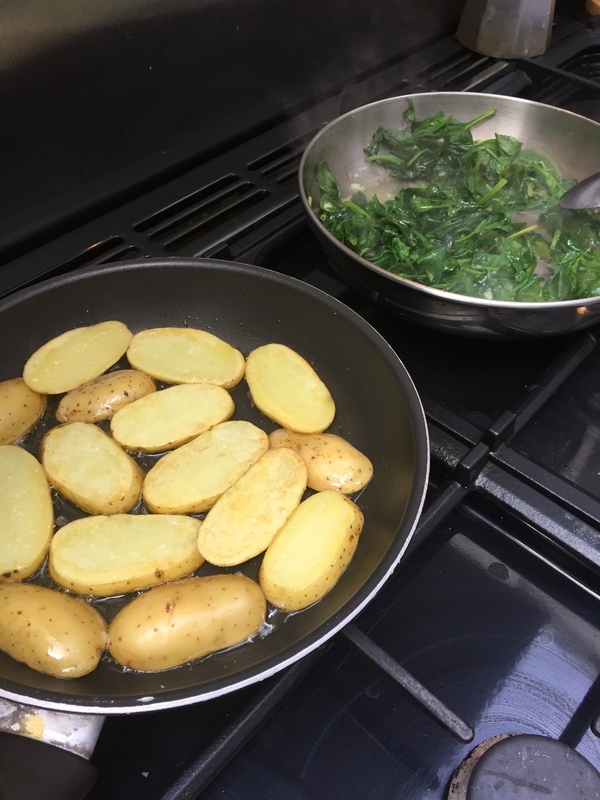 Once the potatoes are golden brown on both sides(probably 8-10 minutes) arrange your wilted spinach and chicken on top of them. 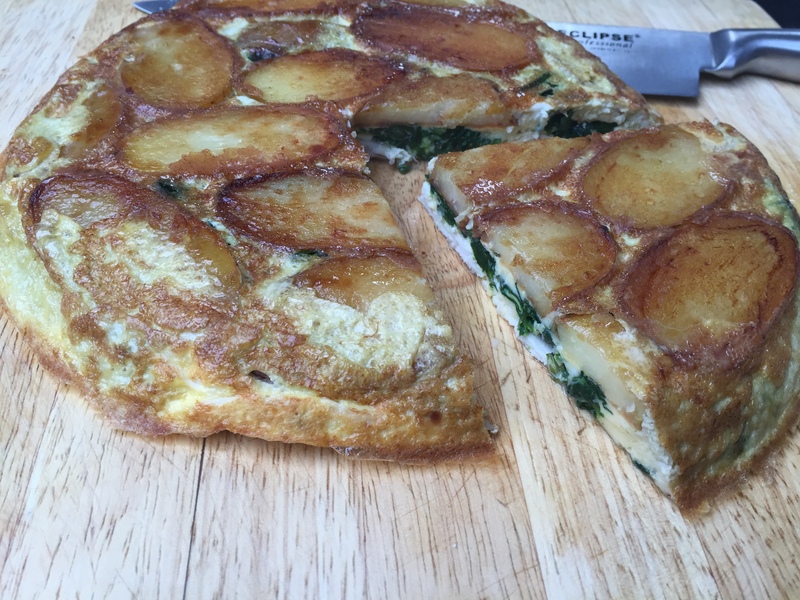 Gluten Free Frittata – Spinach, Potato and Chicken. Beat your eggs together and add these to the pan. Make sure that all your ingredients are covered with the egg. Keep the heat on medium. Cover the pan and leave for 5-6 minutes until the appears set around the edges. 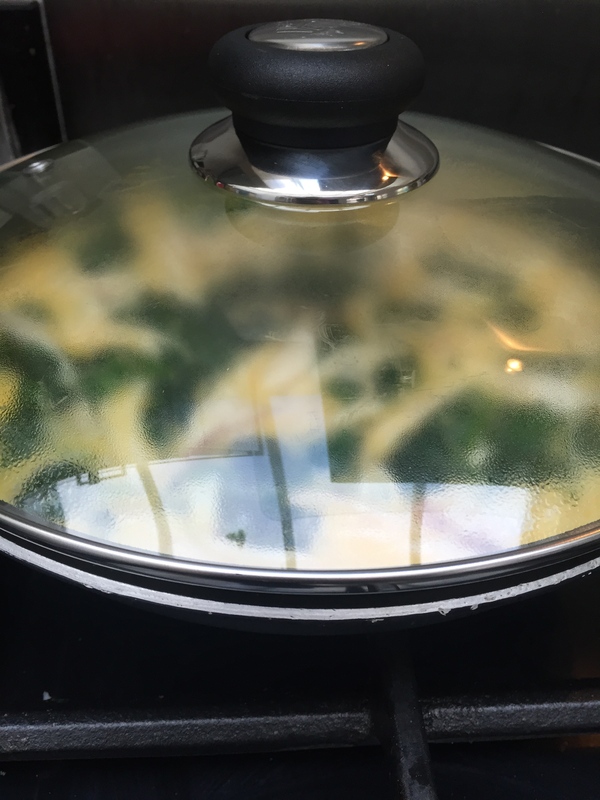 By covering the pan, it helps the steam cook the top of the eggs. I still found the middle of the top of the frittata was wobbly after this time, but I didn’t want the bottom or edges to burn. I put the frittata under the grill for 2 minutes to finish off the cooking and to ensure the whole thing was set. Once it is all set, you can flip it onto a chopping board. 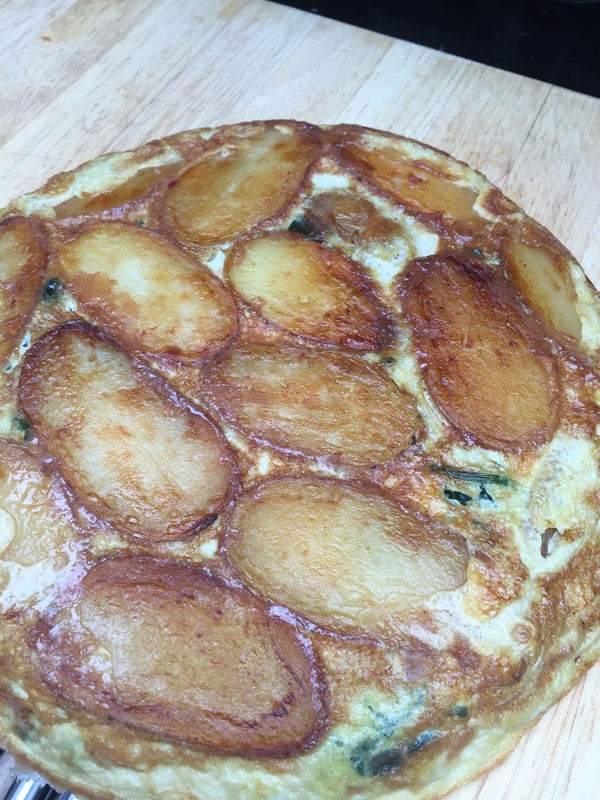 Or hold a plate over the pan and turn it upside down and the frittata should fall out. This is why it’s best to use a non-stick pan. 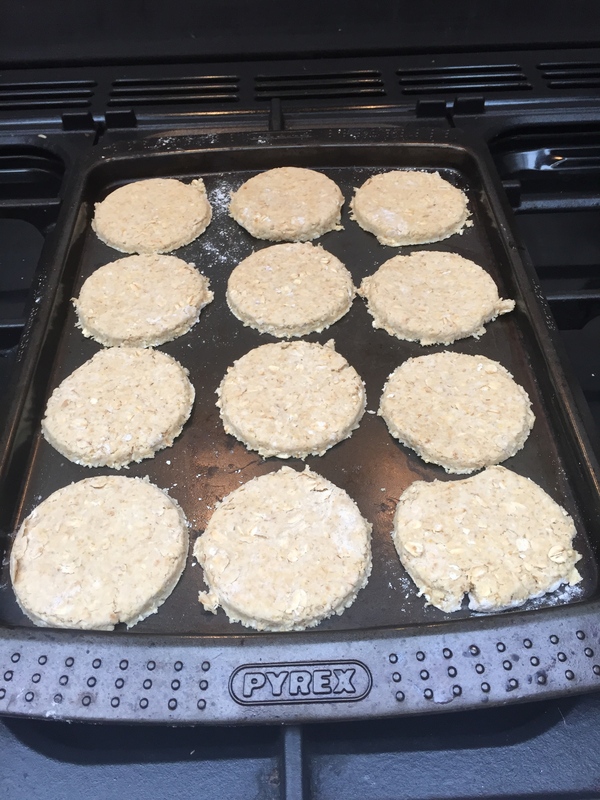 Oatcakes are a great alternative to crackers. I find that the oats fill you up quicker than other crackers and therefore you need to eat less of them. 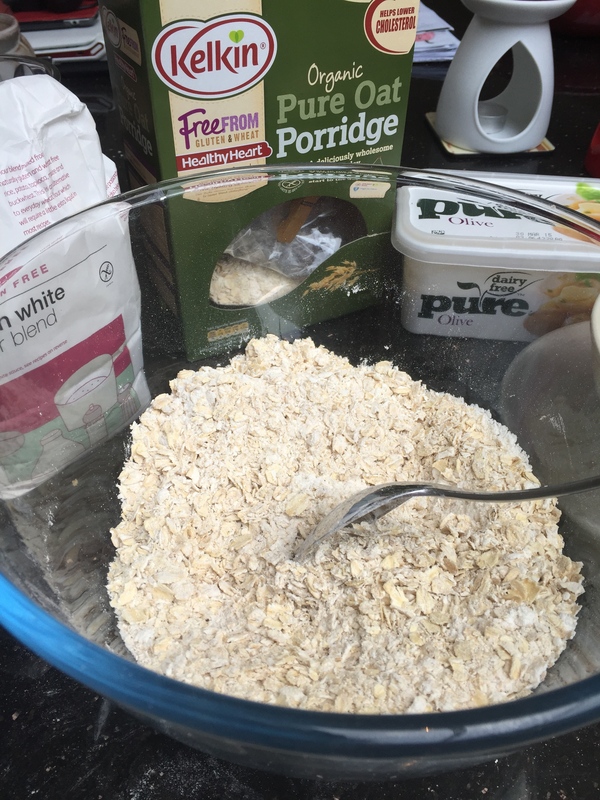 For many years I had excluded gluten free oats from my diet as I thought that I was intolerant. It turns out, it was the milk in the porridge was causing a reaction and not the oats, so I’m really enjoying having them back in my diet. 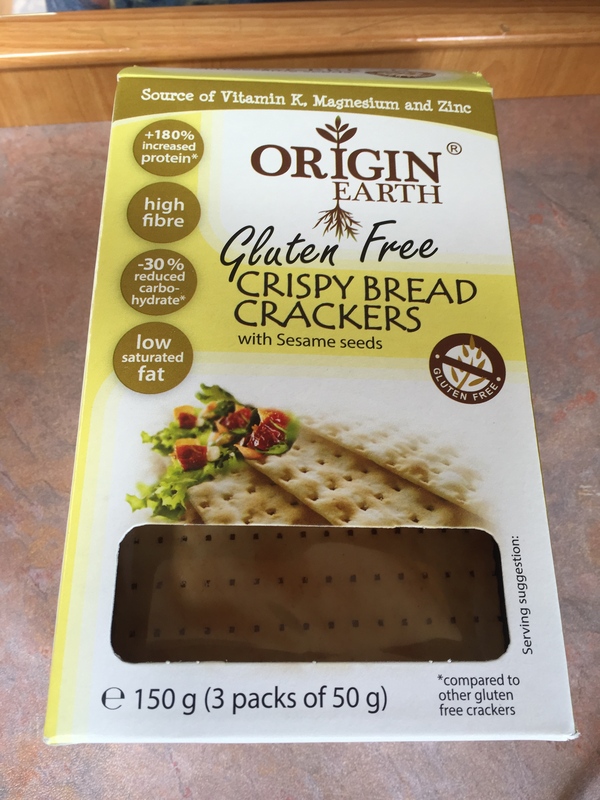 They are a fantastic snack with cheese, hummus, or as an accompaniment to your salad or in your packed lunch. 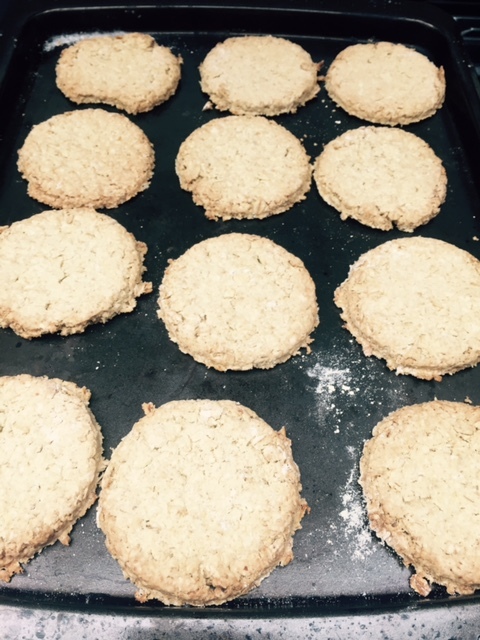 I found it next to impossible to find gluten free and dairy free shop bought oat cakes, so I decided to make my own. 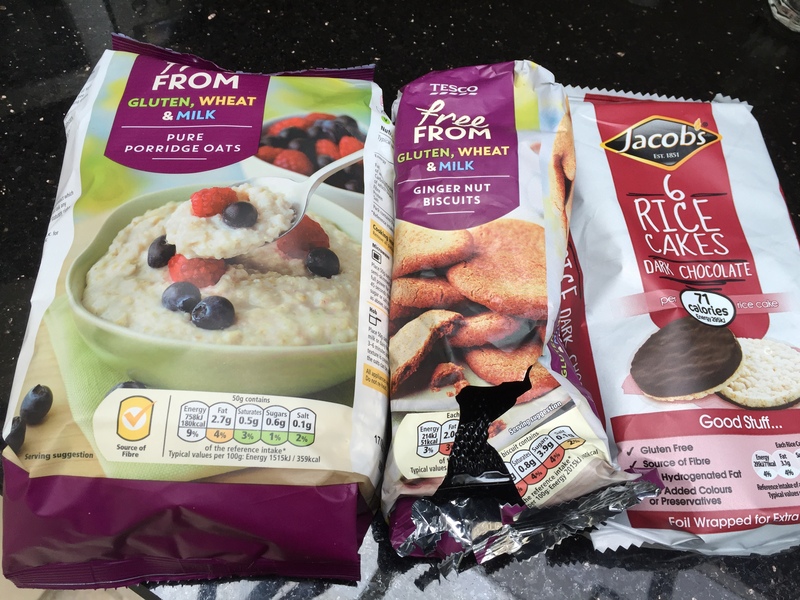 Nairns gluten free oat products are really wonderful if you can get them, however any of their products that I looked at were unsuitable for those with dairy allergies. Hence, I decided to give my own a bash. Pre-heat your oven to 190 degrees centigrade for a regular oven or 180 for a fan oven. Mix all of your dry ingredients together. Gradually add your butter or spread in and mix. It will still seem like a dry mix after doing this, so don’t worry too much. It may appear like breadcrumbs. 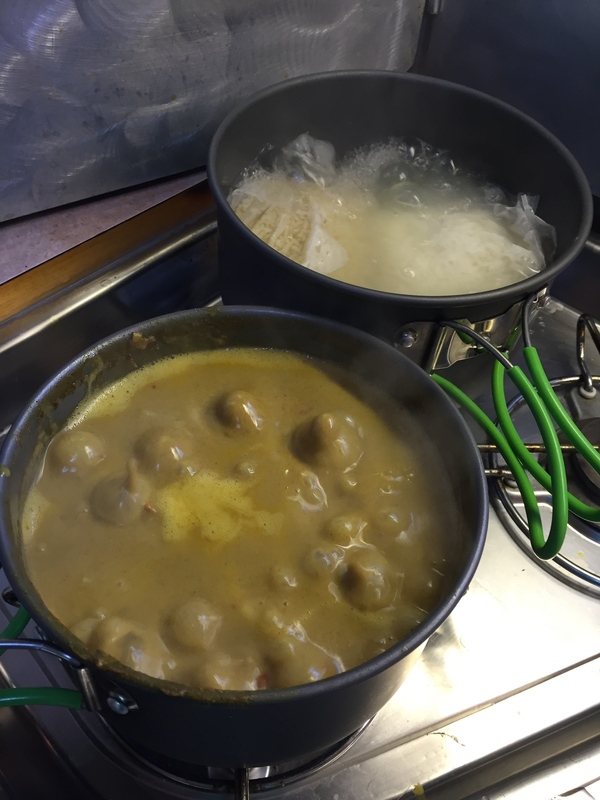 Gradually add the water until the mixture comes together in a ball. 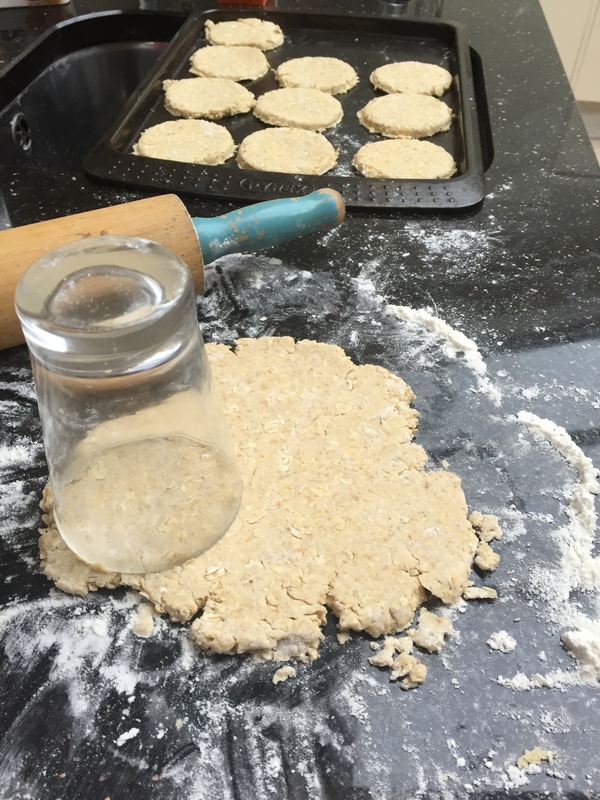 Prepare your work surface with some flour and roll the dough out until it’s approximately half a centimetre thick. I didn’t have a cookie cutter but managed to find a glass that was the right size. Place these on a baking tray. From this mixture I managed to get 14-16 oatcakes. After cutting out the first batch, I re-rolled the dough and got a few more. I then shaped the last couple by hand. Bake these in your preheated oven for about 25 minutes or until they are golden brown. Let them cool before storing. Or, if you’re like me, you’ll just have to sample them as they come straight out of the oven. Yes, burnt tongue, but so worth it. I’m trying to let the rest cool before smothering with hummus! Firstly, wishing you a belated happy and healthy new year and much happiness for 2015. I really want to apologise for my absence on my food blog. This is in part due to having a crappy spell of not so great health. However, I’m back now and feeling great. In December, I found out that I am completely Dairy Intolerant. Prior to this I’d had a string of health problems. I’d been to consultants, dieticians, GPs with a wide and varied list of complaints. Mostly I was in constant pain, my digestive tract felt permanently aggravated, bloated and I was feeling pretty sorry for myself. In the past 12 months I fasted, I had scopes, I discussed my diet, I’d had MRIs on my sinuses and in general had brain fog and lacked energy. After a GP referral, I got a blood test carried out in a reputable allergy clinic. This happened in November and in December I received the result that I’m completely dairy intolerant. I was told that dairy was just sitting in my gut and I can’t digest it, hence so much bloating (not a post meal full belly bloat but a 7 months pregnant bloat). I am also allergic to brewer’s yeast and baker’s yeast. That means I’m unable to eat many gluten free breads, cakes and biscuits. I can eat BFree as all their products are dairy free and their wraps have no yeast. It also means that I can no longer enjoy gluten free beer and most cider. I have found that Orpen’s cider ferment their apples naturally and don’t use yeast. I think, so don’t quote me just yet! Alpro is also my new best friend. So, forgive my absence. I’ve had a lot to get my head around. I’m still on a steep learning curve on completely re-educating myself. I’m trying to cook for a young family, without cutting their dairy as I still think that it’s an important food group for young, growing bones. So, bear with me folks…I promise to try and get some more gluten free recipes up in the near future. On the positive side of things, I know exactly what I can and can’t eat now. I’m still making mistakes, but learning along the way. I feel a whole lot better and I’m much more confident with my food. I’ve more energy and I’m doing lots of walking and weights in the gym. My energy is back where I feel it should be. In the meantime, feel free to chat on Facebook and Twitter. Best wishes and I’ll be back really soon with some tantalising gluten free recipes. 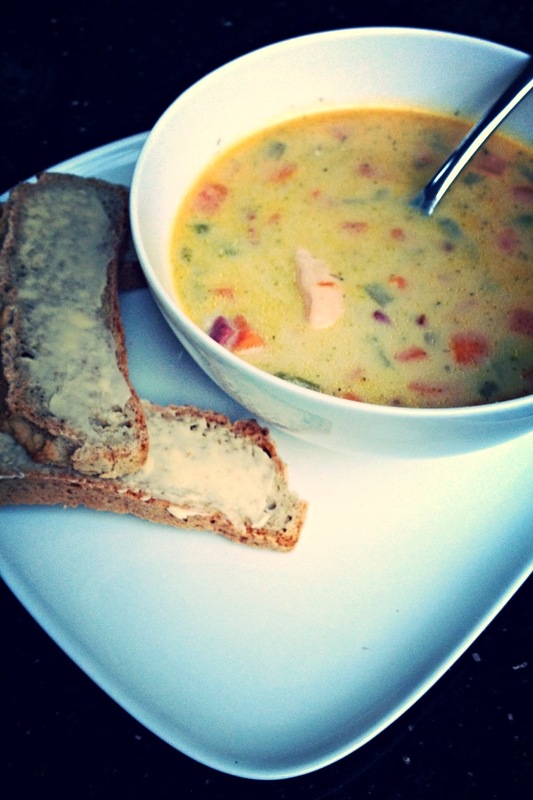 Gluten Free Creamy Fish Chowder. I don’t particularly need a season to eat Fish Chowder, it’s a perfect meal for a summer night or a winter lunch. However, these cold winter evenings, it’s a great belly warmer and heats you up from the inside out! This is a simple meal to prepare. 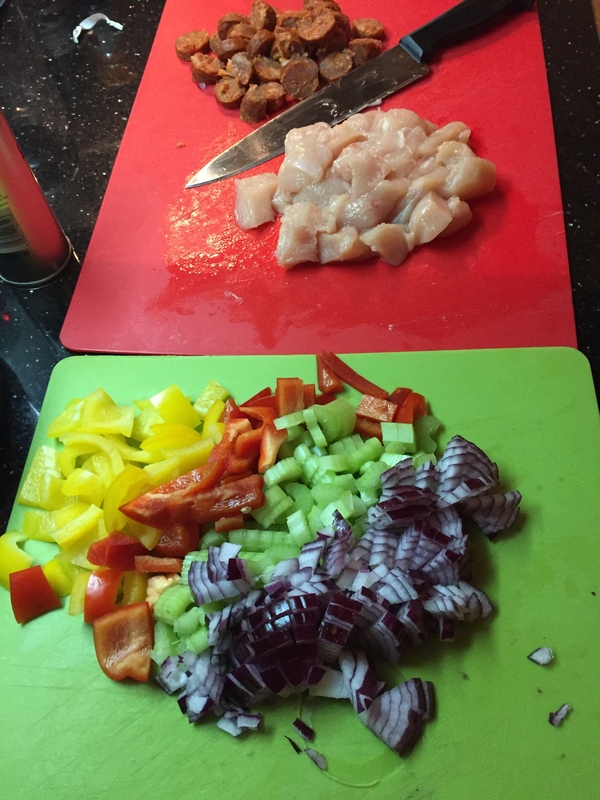 I often do the vegetable stage a day before and then I add the fish and cream whenever I’m ready to prepare the meal for serving. If you would like to keep this recipe dairy free, the chowder is equally delicious without the cream. 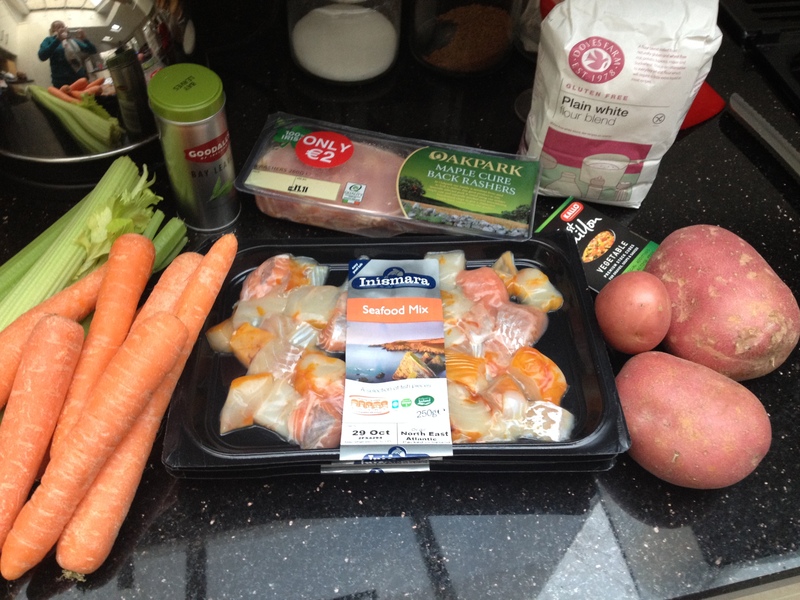 For my fish, I use a mixed fish packet from Lidl which makes for a really economical meal. There is a mix of white fish, salmon and smoked fish. If you’re lucky enough to have a fish monger nearby, they usually do a good fish mix for casseroles or soups. 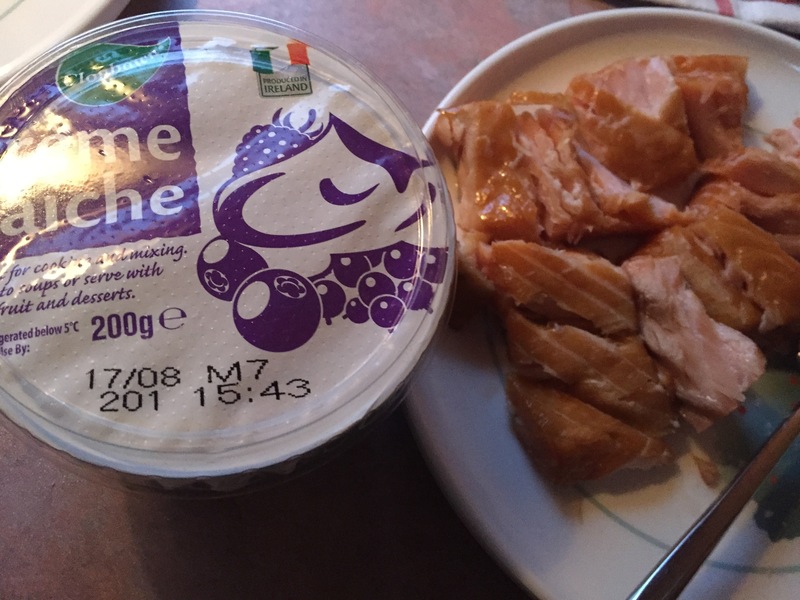 Fish Mix – Smoked Fish, White Fish and Salmon. This is a recipe that is easily doubled up or scaled to suit as many as you would like. 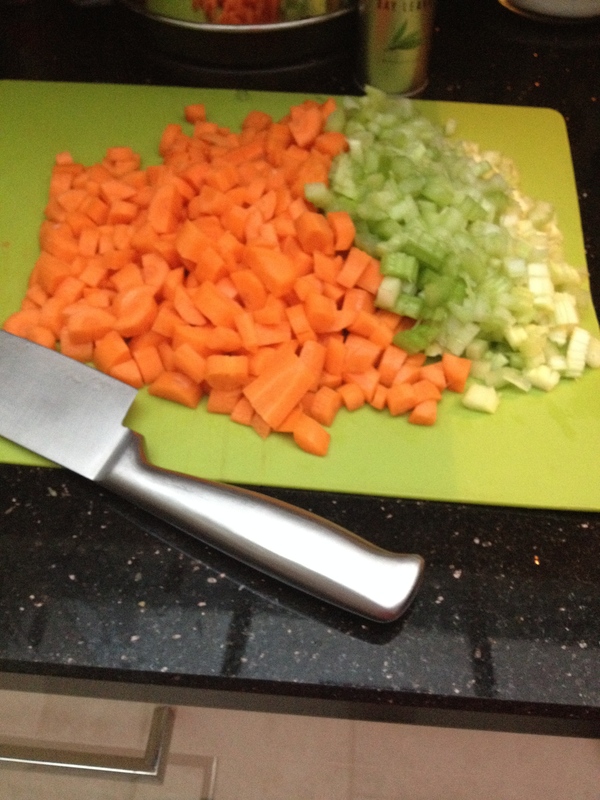 I was cooking a bigger batch for a family get together, hence lots of carrots and extra packets of fish. I prefer to use butter to soften the vegetables in this recipe. You just can’t beat the creaminess. You can use a vegetable oil if you prefer. Chop your vegetables into small bite size pieces, all similar size. If you’re using back or streaky bacon, chop it into small pieces. 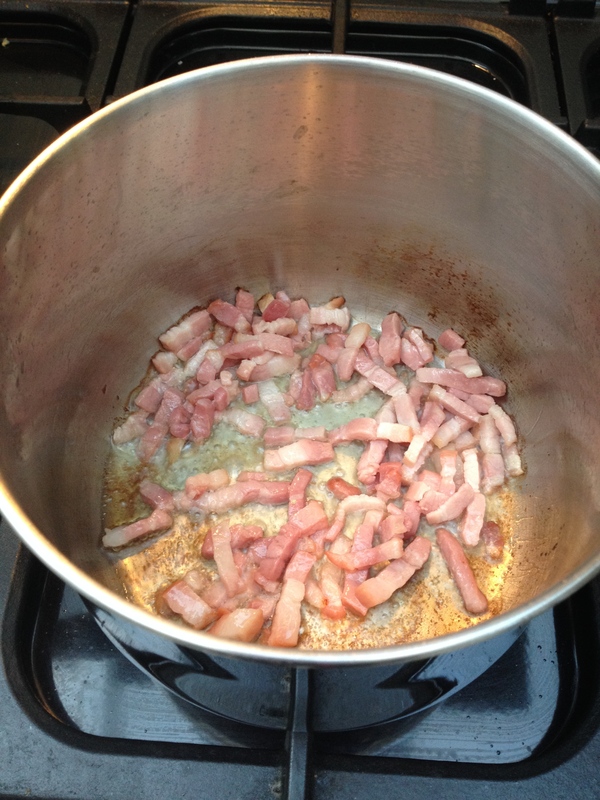 Otherwise, add the bacon lardons to the pan and cook until crispy. 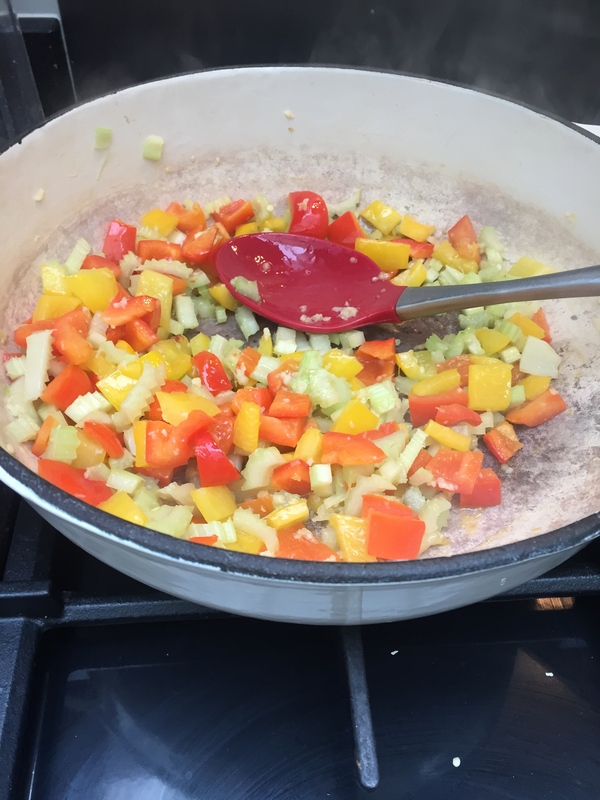 Remove the bacon from the pan and then melt the butter in the pan and add your vegetables to gently soften. You may not need the full 25g of butter. I don’t tend to weigh things that carefully when cooking. Baking must be precise , cooking can be more about winging it! 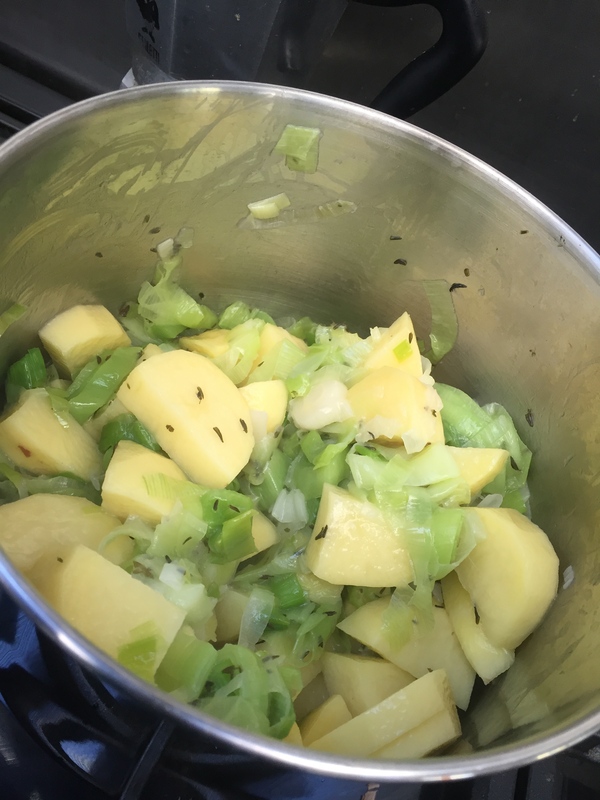 The vegetables are just softening, you shouldn’t have your heat so high that the veg starts to colour or the butter burns. It’s just a very gentle sizzle. Stir the veg all the time to stop the potatoes from sticking to the pan. 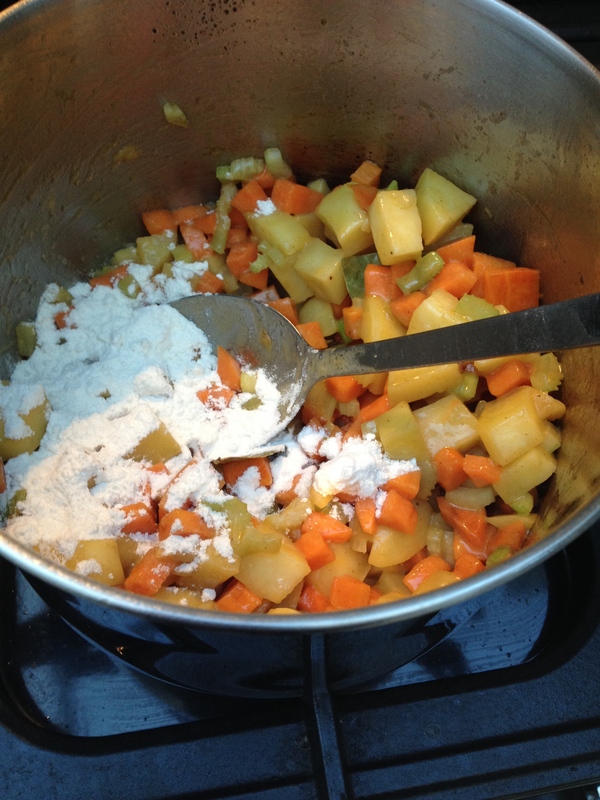 Add your bay leaves and once the veg are soft, add the gluten free flour and stir through with the veg. Then, add your litre of vegetable stock. 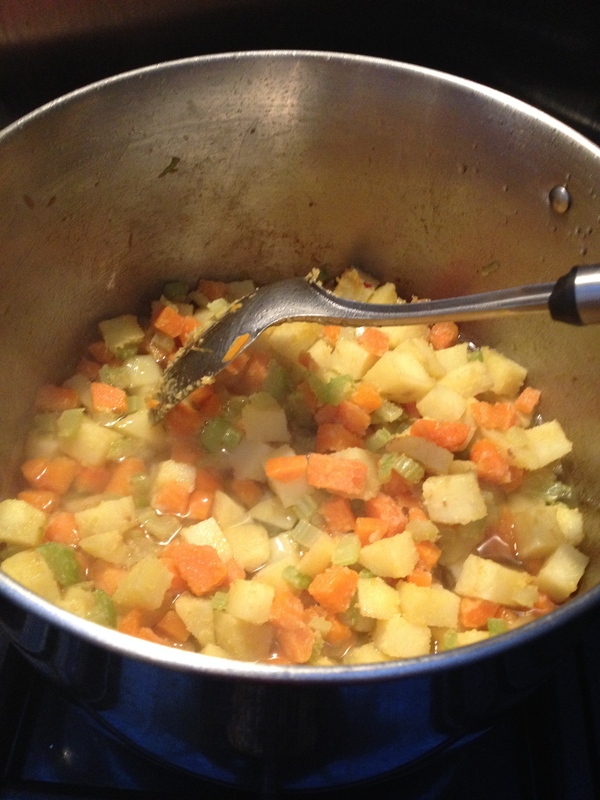 Simmer the mixture until the vegetables are soft. It’s at this stage that you can chill your soup overnight and leave the final prep until you are ready to eat. Add the cream and fish. When you add the fish, it cooks out in under five minutes. I served my chowder with some Sowan’s Gluten Free Bread that I’d baked earlier. This is a fast and tasty family meal that can be enjoyed by children and adults alike. 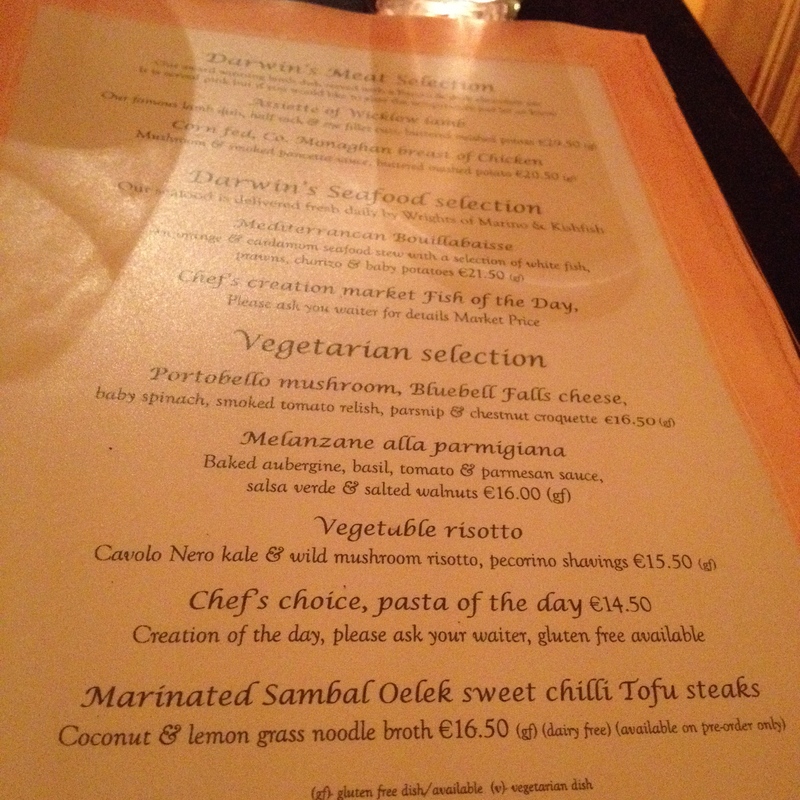 Gluten Free Dinner – Darwins Restaurant, Dublin. Darwins is very conveniently located in Aungier Street, just at the top of South Great Georges Street so extremely central. We were surprised as to how close it actually was to town as we both thought that it was a bit further away. By further away, I should clarify that we thought it was heading towards Wexford street. I’m a nordy living in Dublin, so my excuse is I’m still getting used to the geography. 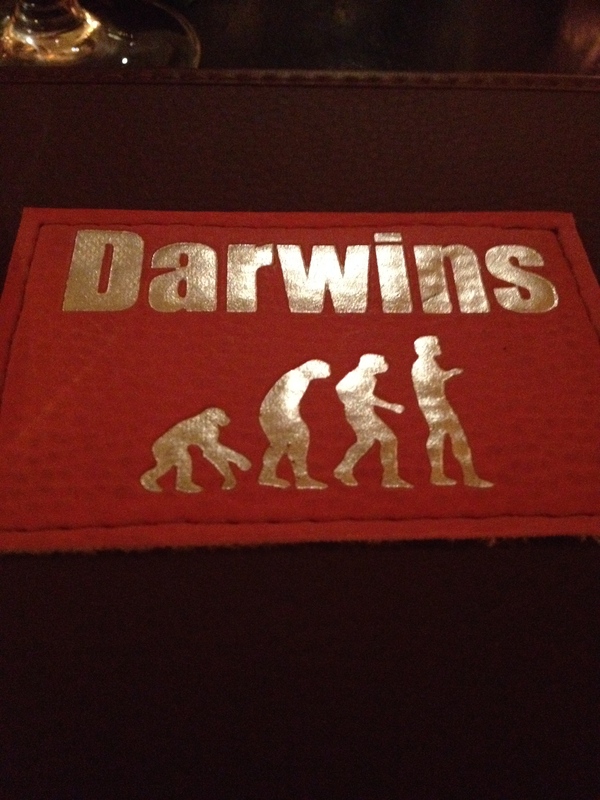 Darwins is a family run restaurant. Upon arrival we were greeted by one of the owners, Dolores who is vegetarian, hence the wonderful selection of food available on a separate menu for non-meat eaters. I do not fall into that category and having looked at the menu, I had my sights most definitely set on a lovely big steak! They have their own in house butcher who supplies the award winning meat (Delores’s Husband). I’d made my reservation with their daughter Amy, who also helps in the running of the restaurant. There was a really warm and inviting atmosphere in the restaurant, that by the way, was fully booked. If you do decide that you’d like to try here, be sure to book a table well in advance. 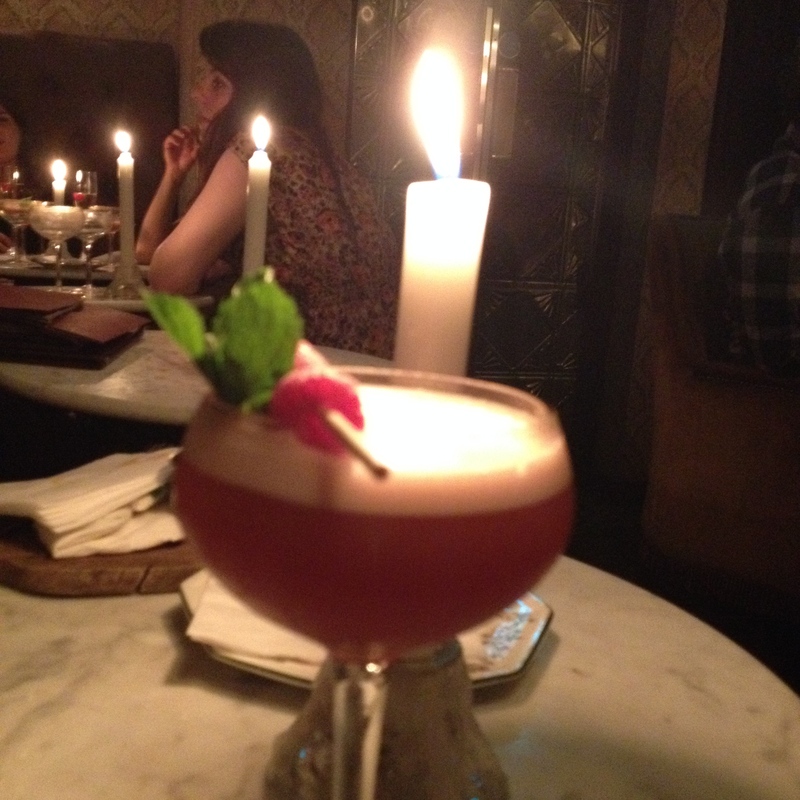 I managed to get an early table from 7pm – 9pm which suited us perfectly. The restaurant is deceptively large and we were shown to our table which through the front restaurant and down corridor to a smaller area than the front, but still beautifully intimate. 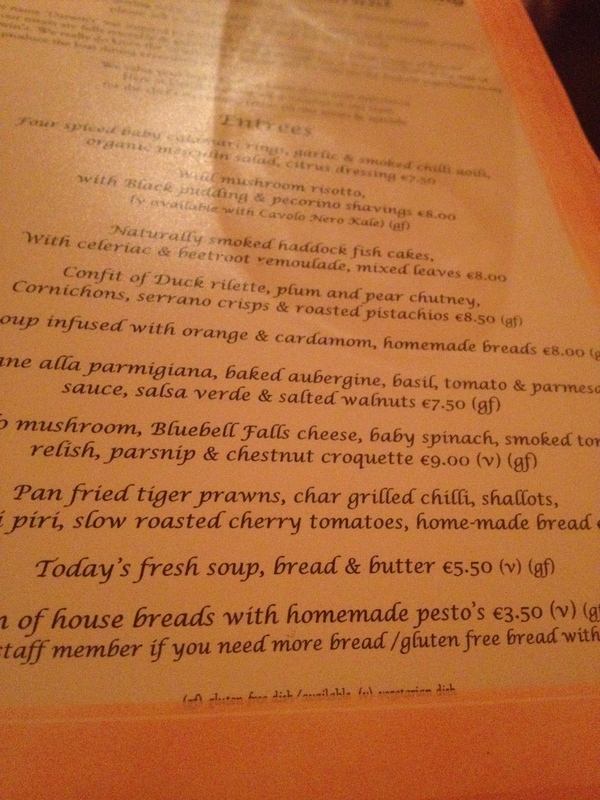 Upon opening the menu, it’s immediately evident that they are coeliac savvy. There are lots of options that are gluten free and also vegetarian. They have gluten free bread options and they also clearly mark on their menus that they have no problem giving you additional gluten free bread with your meal, should you require it. They also have a separate fryer for their chips, so if you want steak and chips for your gluten free dinner, it’s no problem. I know from experience, this is most certainly not the norm in many restaurants. The wine list has plenty of choice and a wide range of prices. For my starter I opted for a Portobello Mushroom, Bluebell Falls Cheese, Baby Spinach, Smoked Tomato Relish, Parsnip and Chestnut Croquette. This is served with gluten free bread, which I declined as I went on to order a 14oz steak and I wouldn’t risk filling on bread! While we are waiting on our meal, we enjoyed a glass of wine. 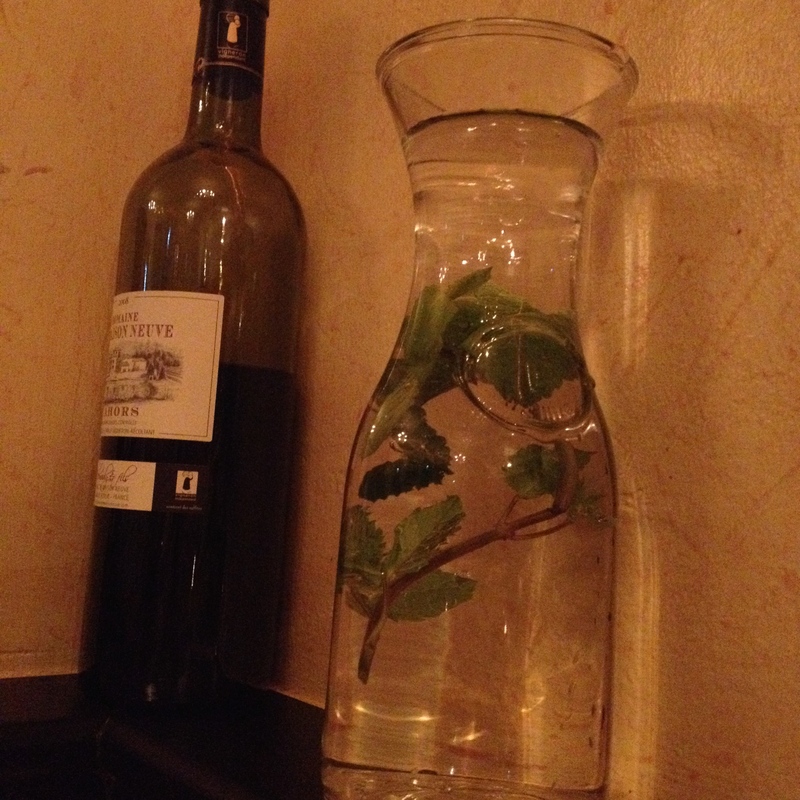 The waiter also brought a carafe of water, which is always appreciated in restaurants. 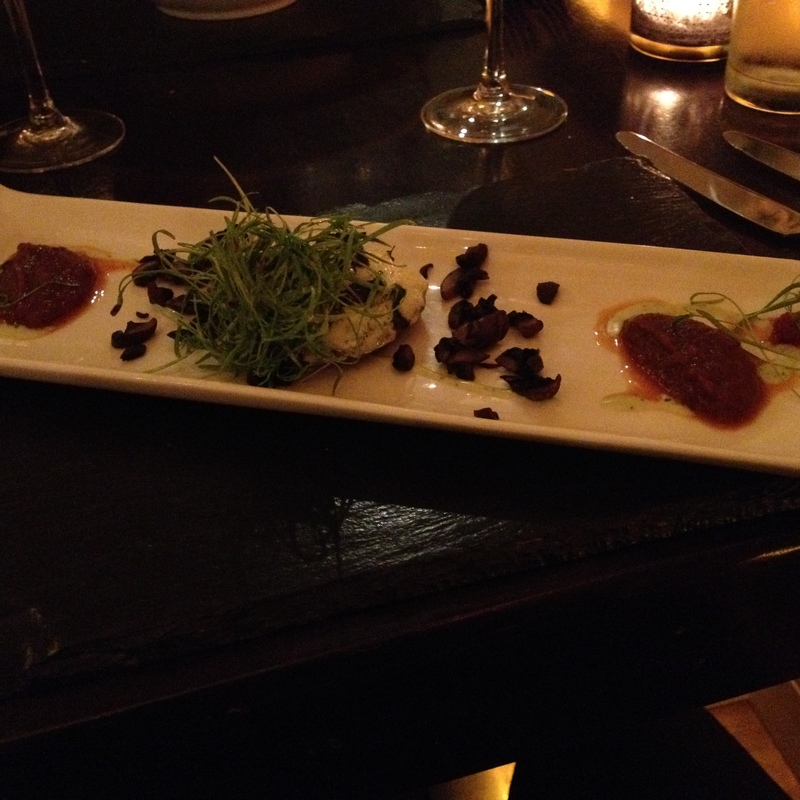 I think that you’ll agree, the starter was beautifully presented. I enjoy my steak medium, so the test is in the cutting. I think you’ll agree it was pretty perfect looking. The taste was deep and intense and really very, very good. The steak comes with mash on the plate and you can order sides. I had buttered spinach and I tasted a few of my husbands chips – research purposes. 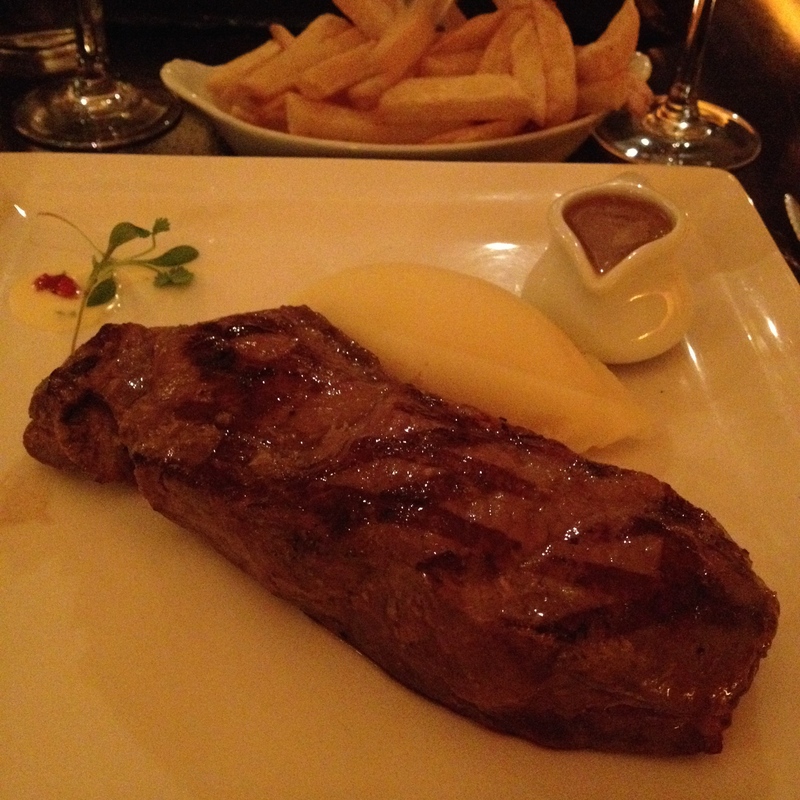 He ordered the Fillet and was also impressed at the tenderness. All in all, a very good meal. I can highly recommend Darwins for their gluten free menu choices and also their knowledge about coeliac disease and the importance of avoiding cross contamination. Their waiting staff were non intrusive but close by if you needed anything. We didn’t opt to have a dessert as after that amazing steak, I honestly didn’t have room for it. They do have a gluten free Eton Mess. 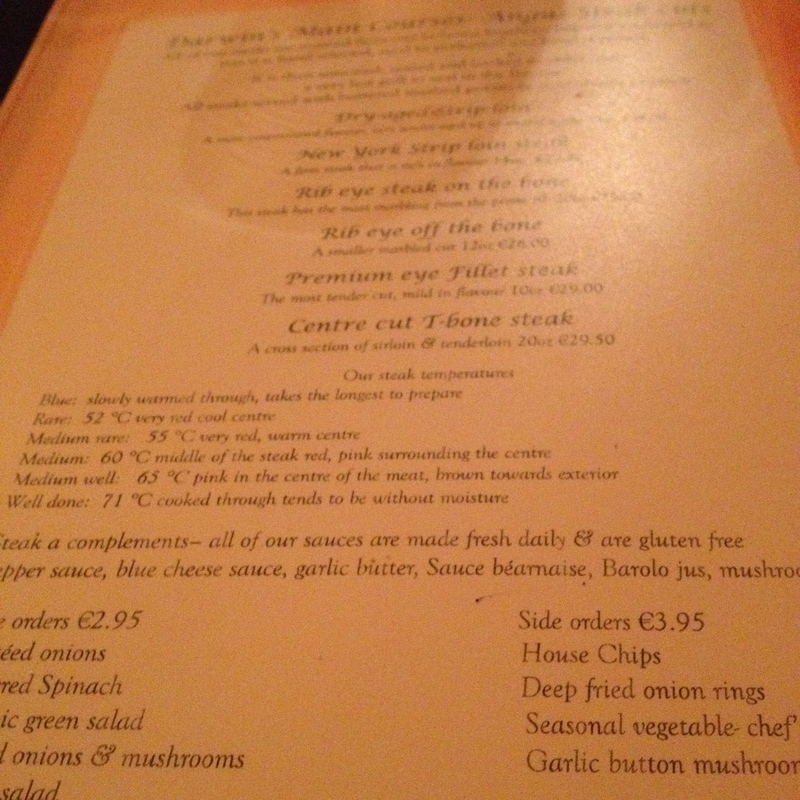 So whether you’re vegetarian, or a steak eater, Darwins is a fantastic restaurant both for their knowledge of coeliac and also for the wide variety of gluten free menu choices. Instead of dessert, we did manage to stop by at the Vintage Cocktail Club for an after dinner drink before heading home. Another place I’d been wanting to try in town for ages. The little black door was answered. They can also rustle up a few gluten free dishes if you decide to dine there, however this time, it was a post dinner drink. I had a great night out in Dublin. 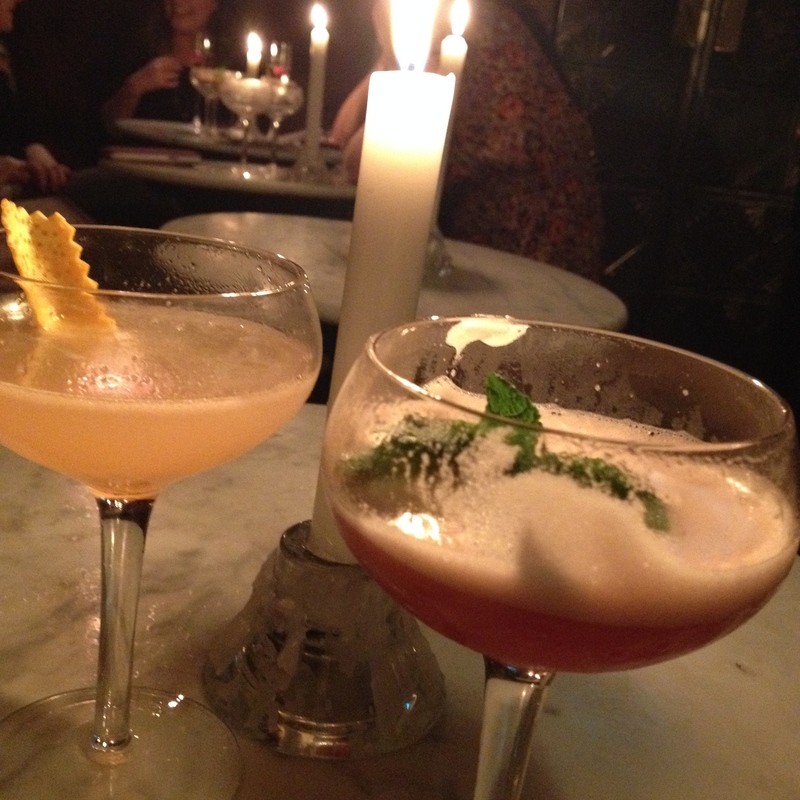 Fantastic gluten free food, cocktails and company.